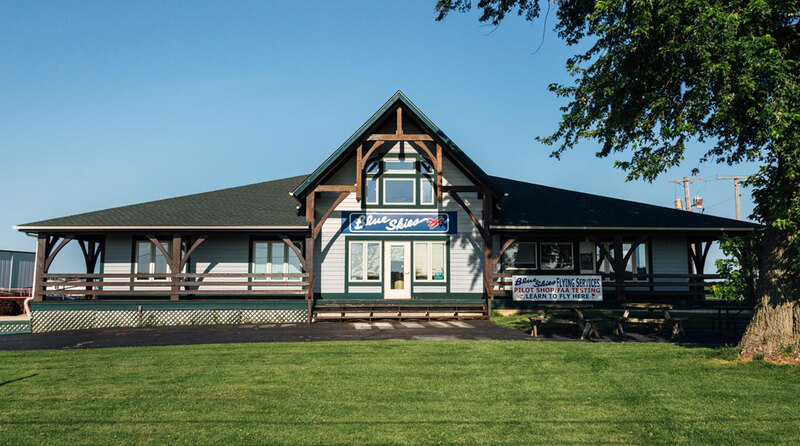 flight training, rental, maintenance and more. 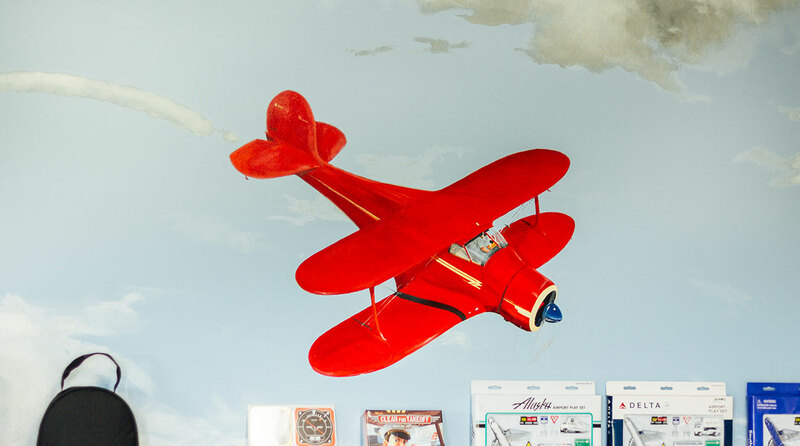 We at Blue Skies Flying Services believe that flying is FUN and we try to teach that way, too. When it stops being fun, we will stop flying. 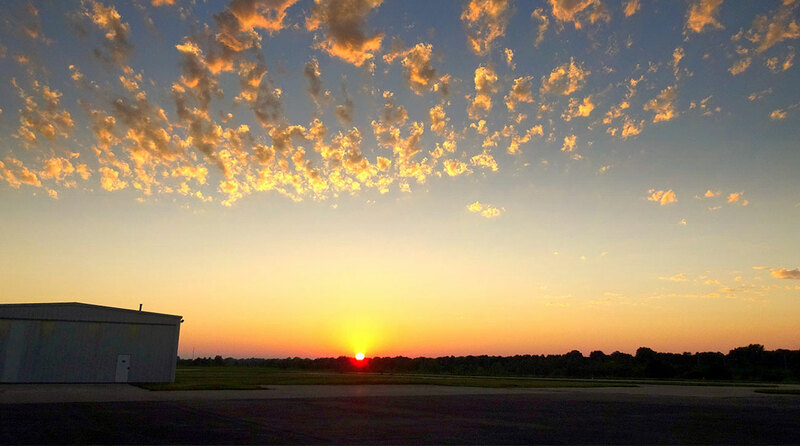 The excitement you feel on the first flight should continue through all your flying. We work to keep that up. 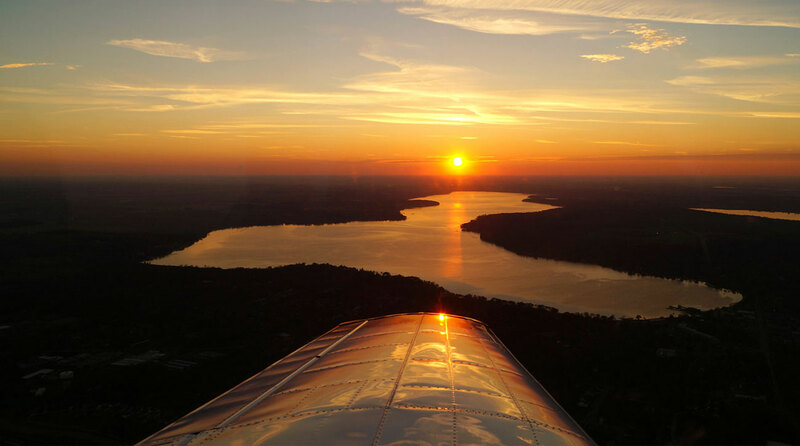 At the same time, we approach each flight lesson in a professional manner because the Private Pilot certificate can be the first step toward a career in aviation. 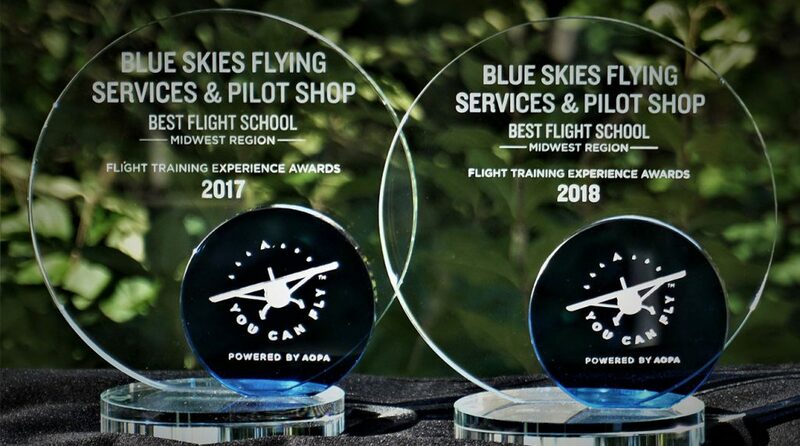 Blue Skies Flying Services have repeated last year’s AOPA award as Best in the Midwest! 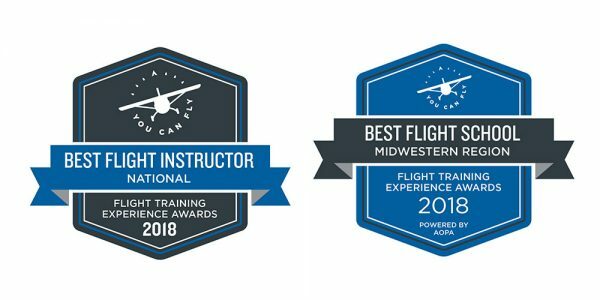 CFII and Chief Flight Instructor Mike Biewenga was not only awarded as BEST in the MIDWEST, but in the NATION! 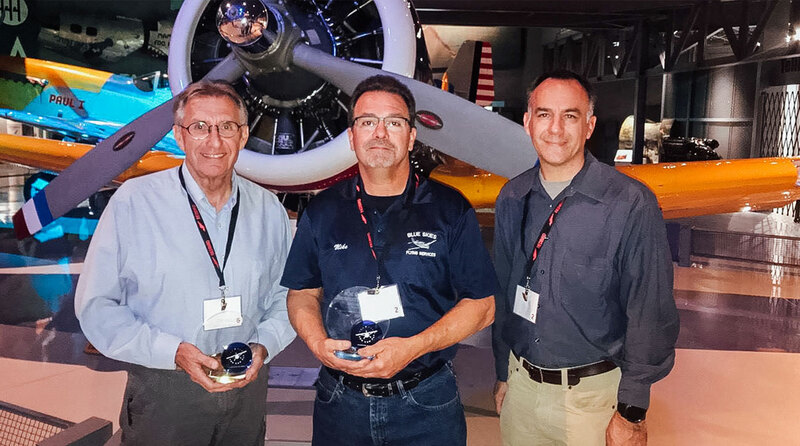 CFII Jim Fellers and CFII Joseph J, Zubaywere also recognized as distinguished flight instructors! 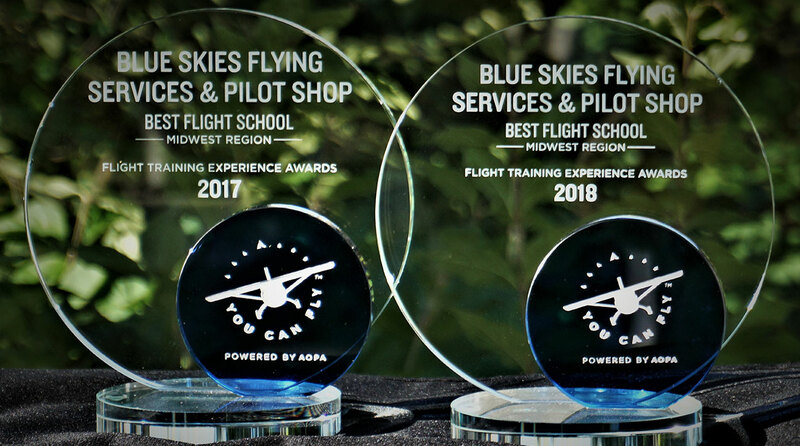 We are beyond excited, proud, and THANKFUL to our extended Blue Skies family—students, pilots, staff, and their family and friends! Congratulations to our Member's Accomplishments! 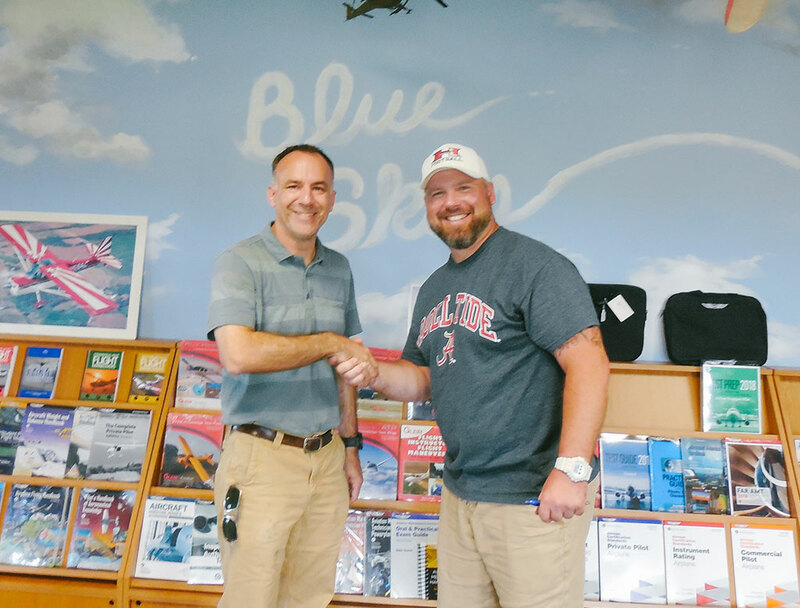 A huge congratulations to Andrew Thome, who completed his Private Pilot checkride in Archer N721SM! A big thanks to CFII Mike Biewenga and DPE Gail Lapook. 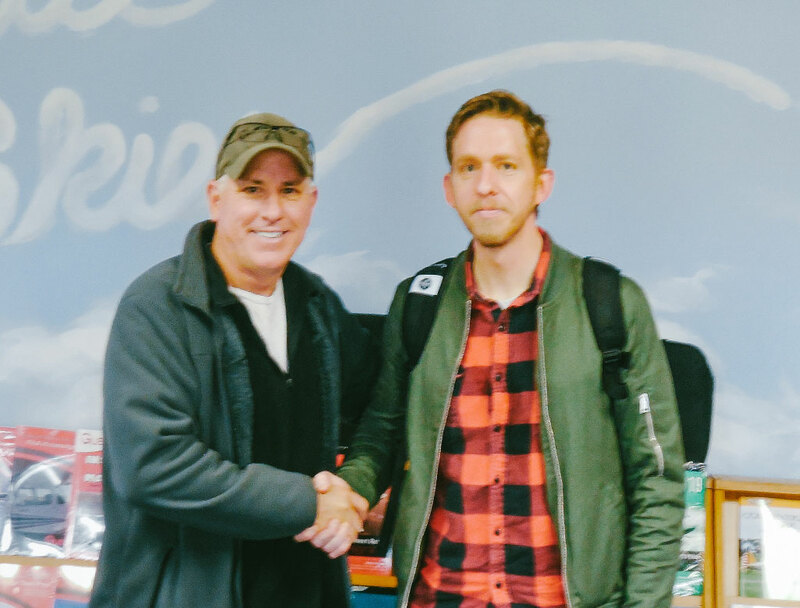 A huge congratulations to Chris Wilson on passing his private pilot checkride in Warrior N4627F! 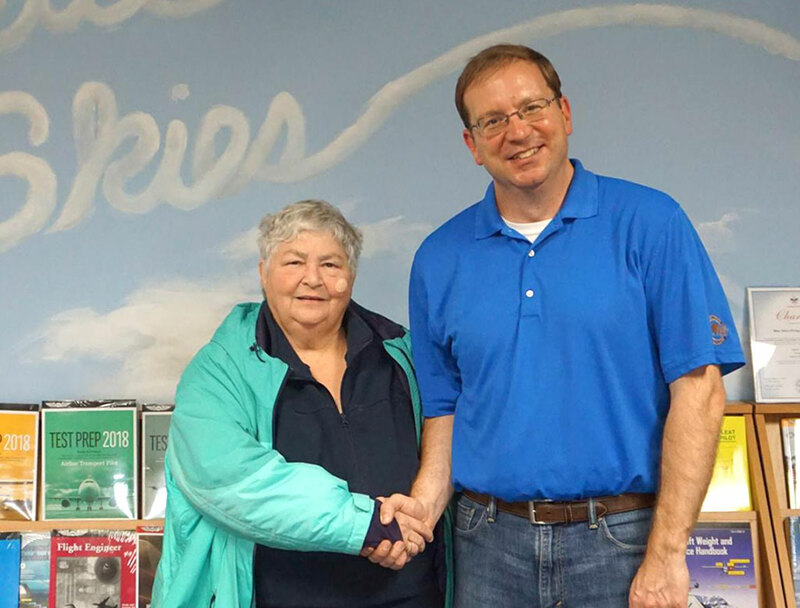 A big thanks to your CFII, Joe Zubay.Pictured with DPE Gail Lapook! A huge congratulations to Jessica Bernin, who completed her first solo in Warrior N432403! A big thanks to your CFII, Randy Awker! A huge congratulations to Austin Gilson, who completed his first solo in Warrior N4627F! A big thanks to your CFI, Brandon Kuhn! 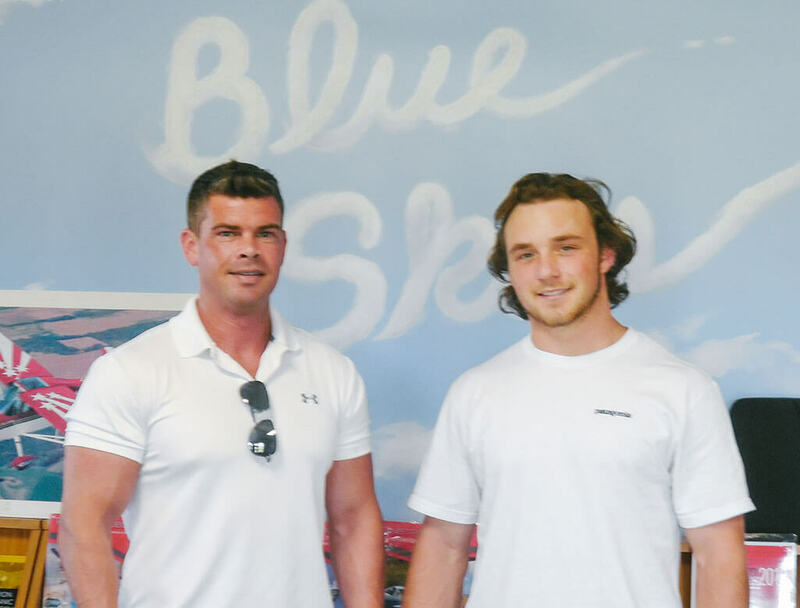 A huge congratulations to Tom Blackman, who completed his commercial rating! 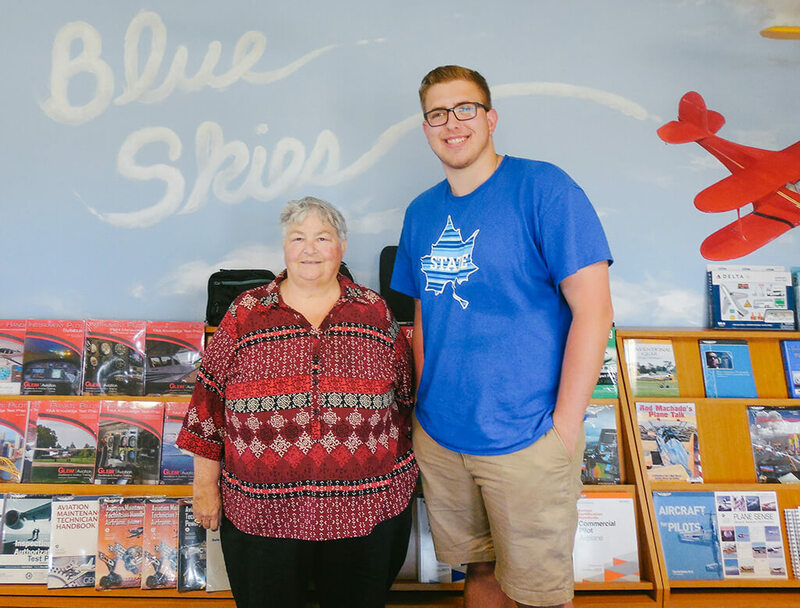 A big thanks to your CFI, Nathan Hartley and pictured with DPE, Gail Lapook! 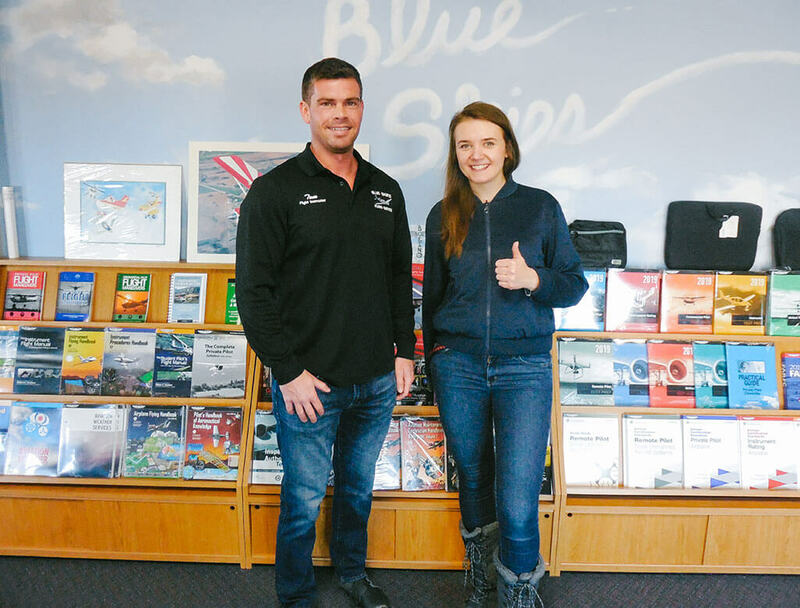 A huge congratulations to Yanina Necker, who completed his first solo in Warrior N32403! 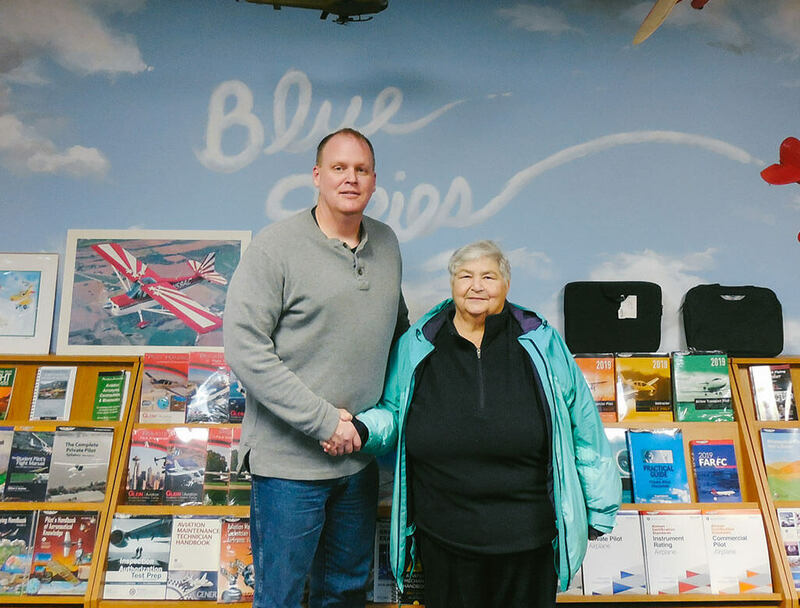 A big thanks to your CFI, Tom Laughlin! A huge congratulations to Bryan Dorman, who completed his first solo in Piper Warrior N43020! A big thanks to your CFII, Jim Fellers. 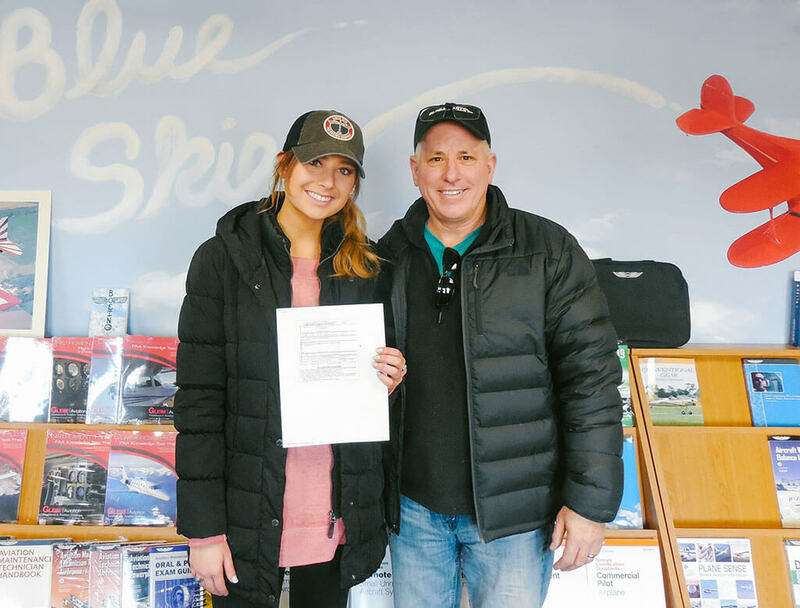 A huge congratulations to Madison Fulgenzi, who completed her private pilot checkride in Piper Warrior N32403! 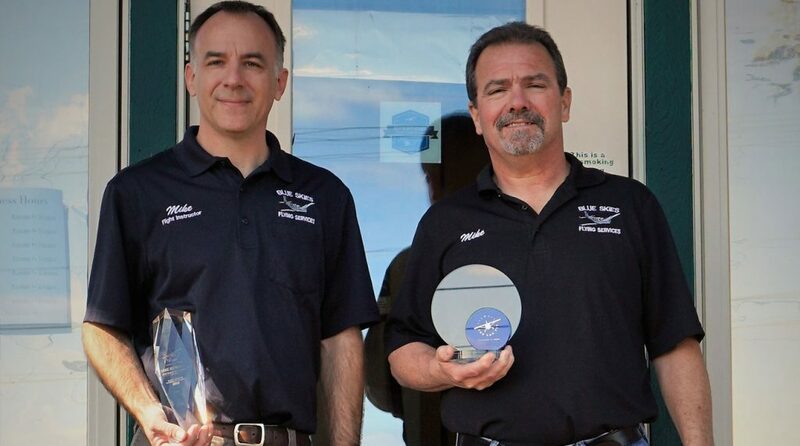 A big thanks to your CFI, Tom Patinella and DPE Dave Monroe. 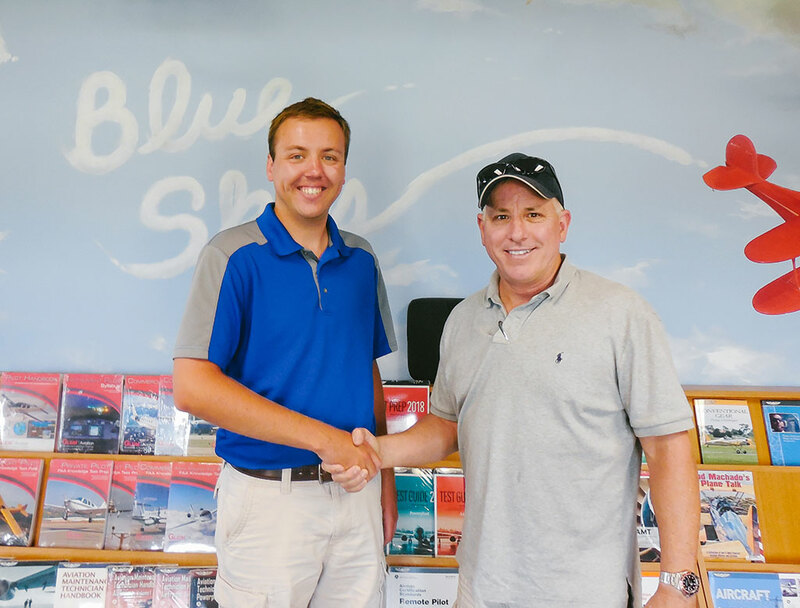 A huge congratulations to Matt Zimolzak, who completed his private pilot checkride in Cessna N456ER! A big thanks to your CFII, Mike Biewenga and DPA Dave Monroe..
A huge congratulations to Kelly Koeller, who completed his first solo in Warrior N4627F! A big thanks to your CFII, Joe Zubay. 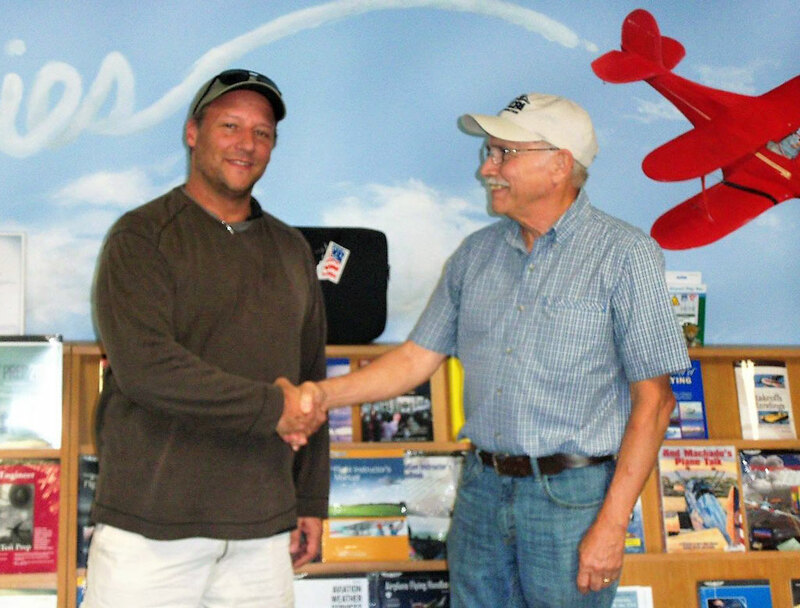 A huge congratulations to Bob Esvang, who passed his private pilot checkride in the Cessna N456ER! 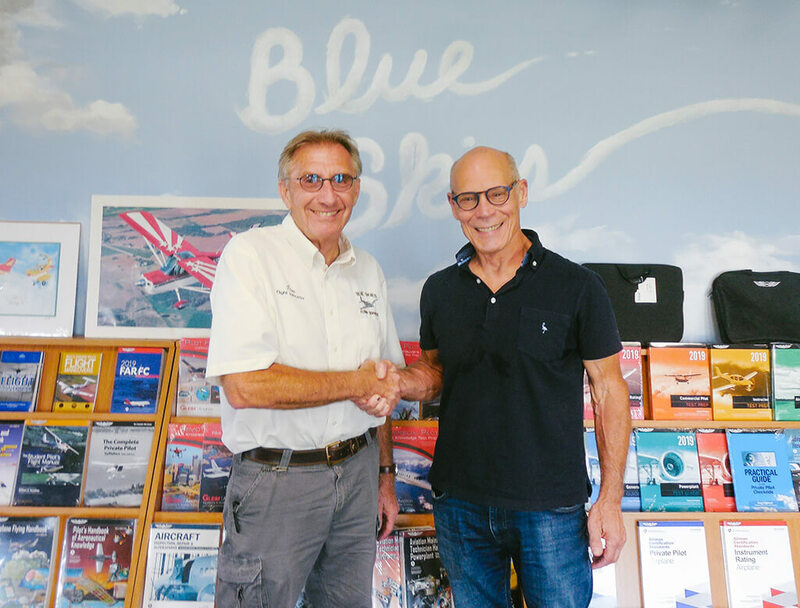 A big thanks to your CFI, Phil Stegge. Pictured with his DPE Dave Monroe. 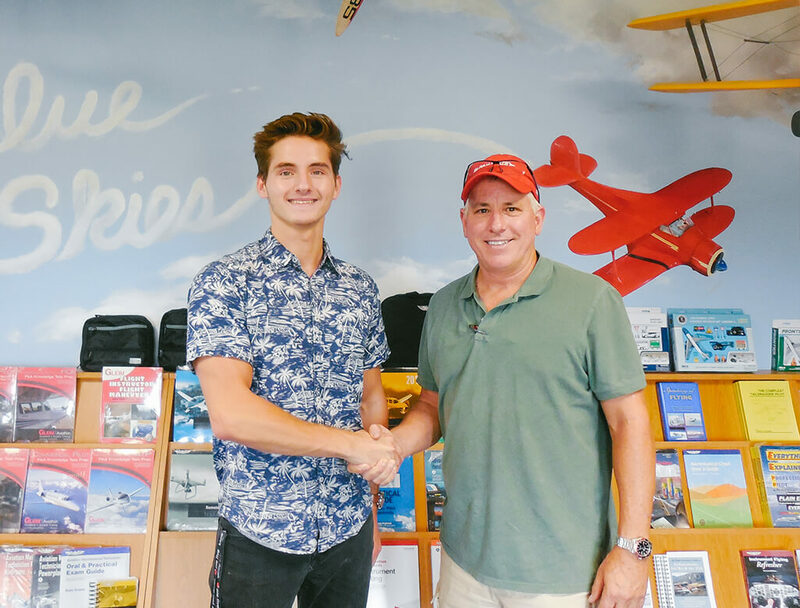 A huge congratulations to Riley Conroy, who passed his private pilot checkride in the Piper Warrior N32403! A big thanks to your CFI, Mike Biewenga. Pictured with his CFI Mike and DPE Dave Monroe. A huge congratulations to Dan Biell, who passed his private pilot checkride in the Piper Warrior N32403! 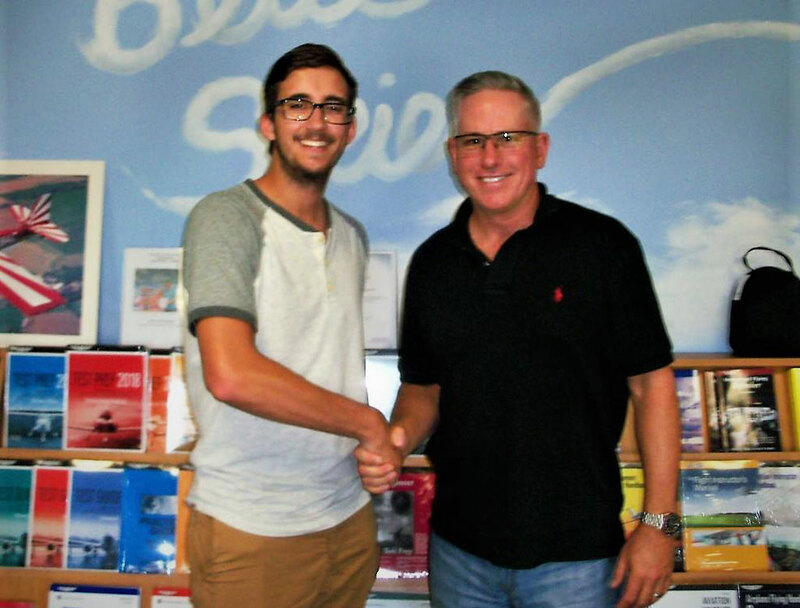 A big thanks to his CFI, Alex Priester. Pictured with his DPE, Gail Lapook. 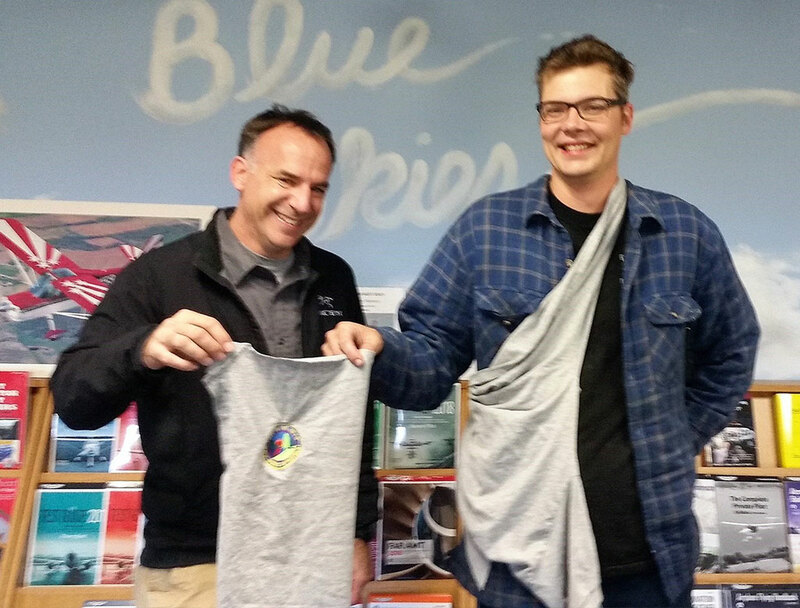 A huge congratulations to Quinton Urban, who completed his first solo in his Dad’s 182, N82TL! A big thanks to his CFII, Jim Fellers! 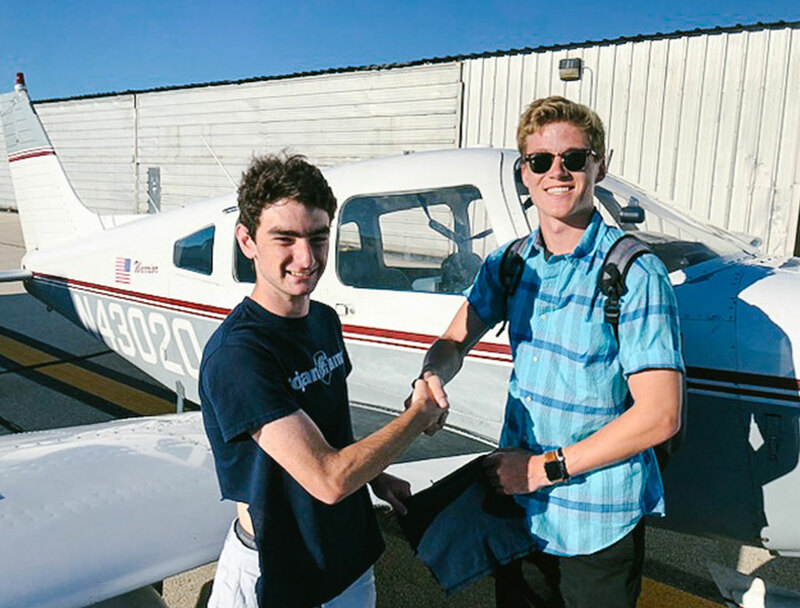 A huge congratulations to William Schroeder, who completed his first solo in the N55452! A big thanks to his CFII,Jim Fellers! 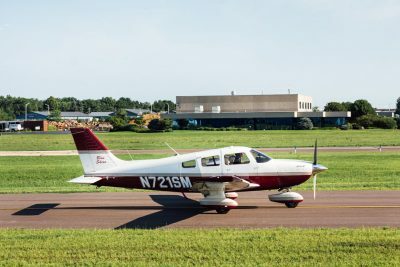 A huge congratulations to Pranav Vyas, who completed his first solo in a Piper Warrior N4627F! 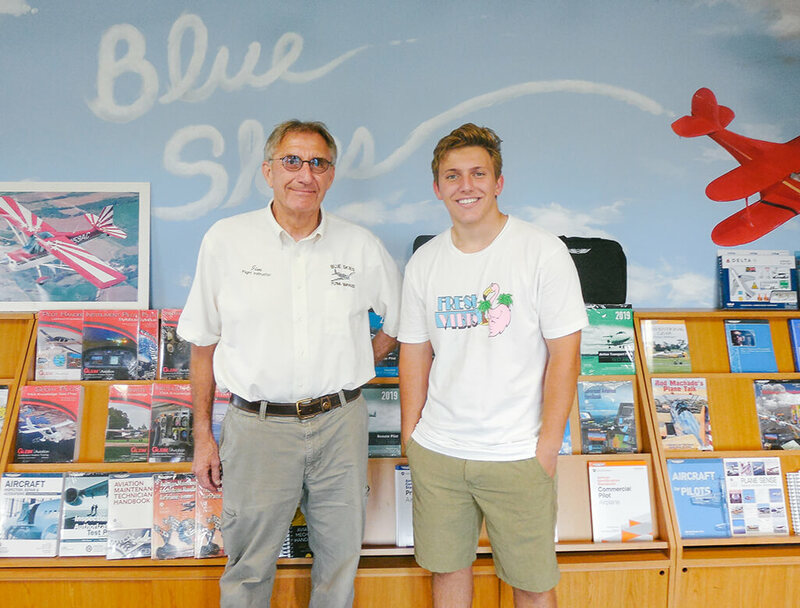 A big thanks to his CFI, Alex Priester! 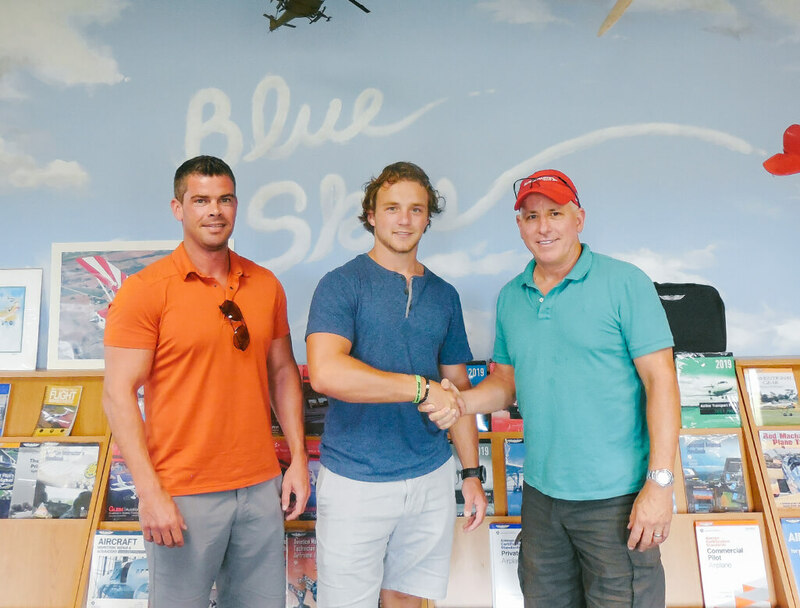 A huge congratulations to Cullen Chudik, who passed his private pilot checkride in the Piper Warrior N32403! 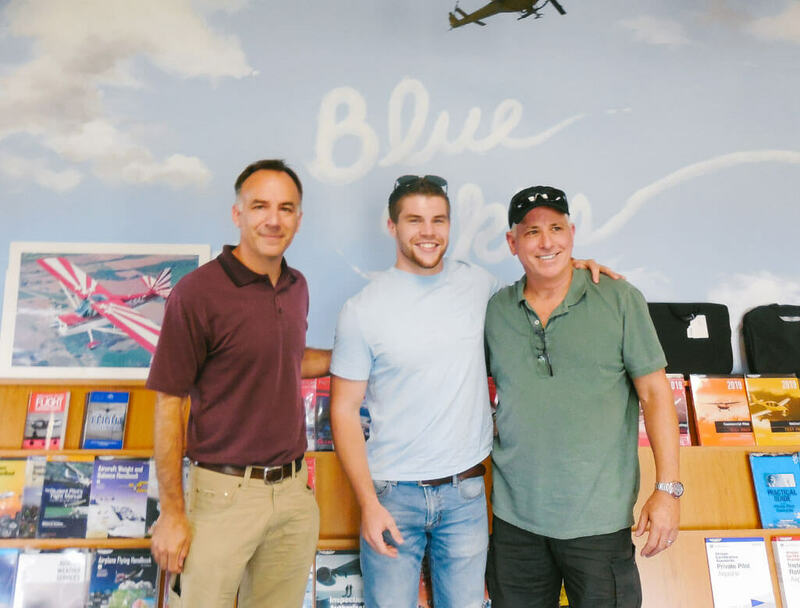 A big thanks to his CFI, Tom Laughlin. Pictured with his DPE, Dave Monroe. 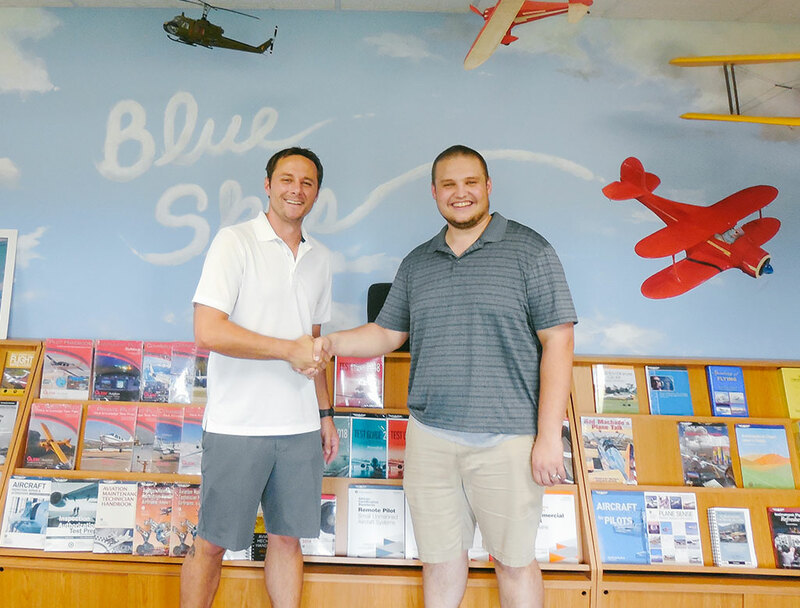 A huge congratulations to Lucas Chaffin, who passed his private pilot checkride in Piper Warrior N32403! 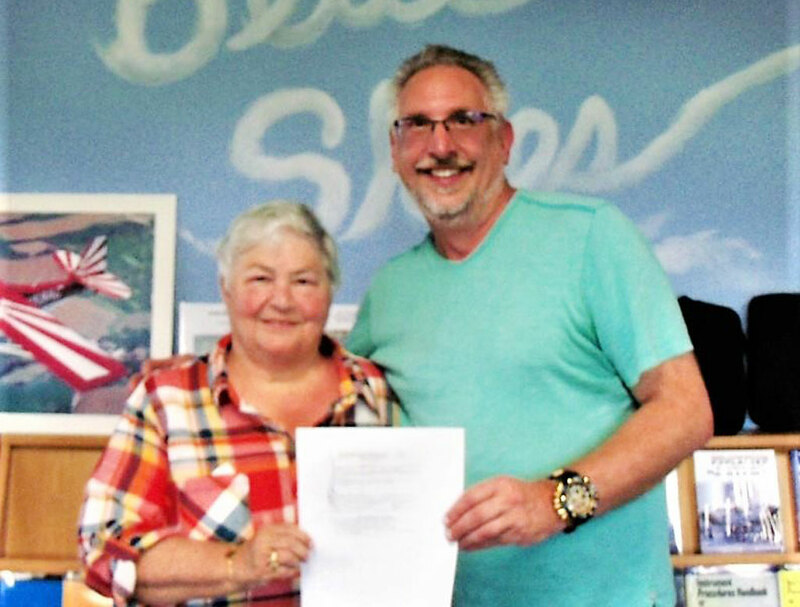 A big thanks to his CFI, Alex Priester, as well as DPE Gail Lapook! A huge congratulations to Maciej Kawecki, who passed his private pilot checkride in Piper Warrior N32403! 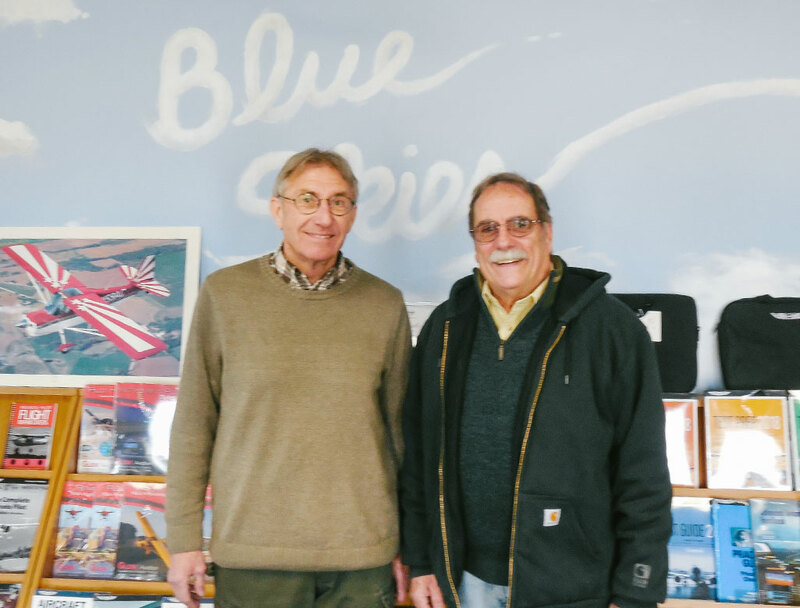 A big thanks to his CFI, Tom Laughlin, and DPE Dave Monroe (right)! 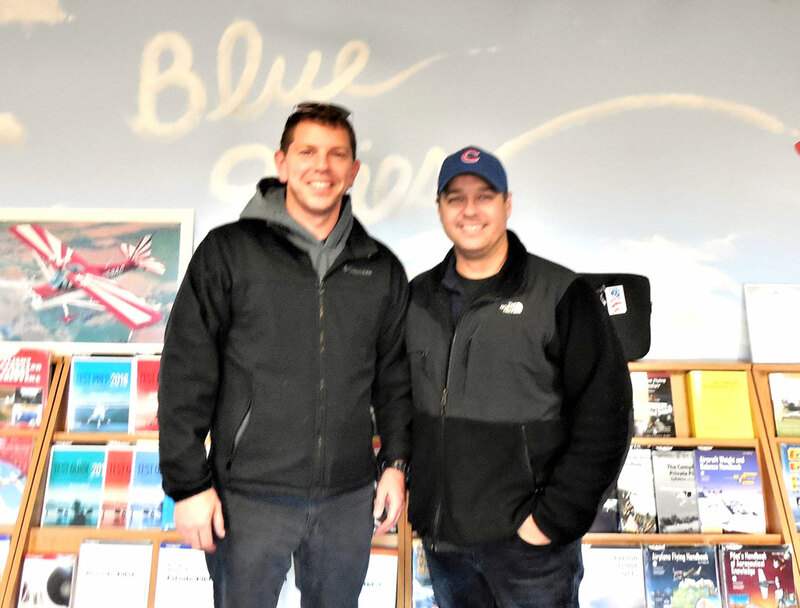 A huge congratulations to Tom Patinella, who passed his CFI rating and will be joining the Blue Skies team! A big thanks to his CFII, Jim Fellers, as well as DPE Alan Zielinkski. Pictured with Alan Zielinski! 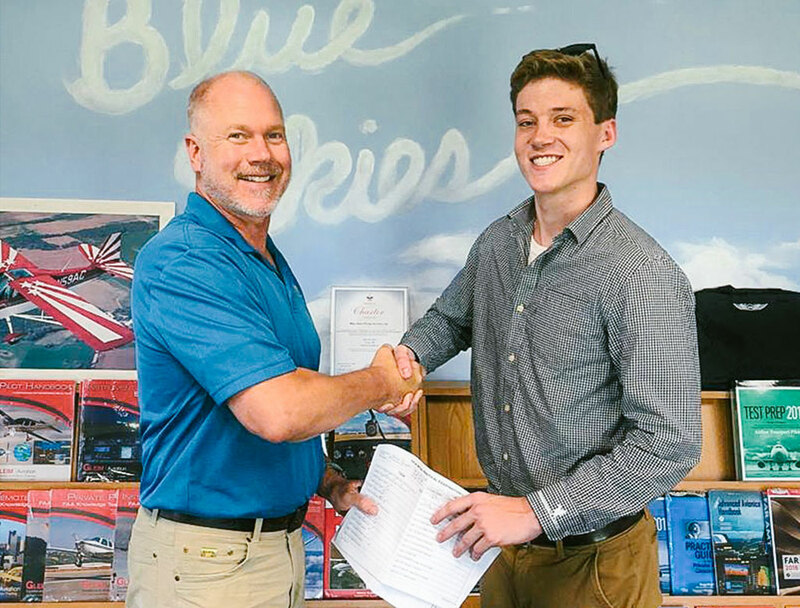 A huge congratulations to Parker Ritter, who passed his private pilot checkride in Cessna N456ER! A big thanks to his CFI, Mike Biewenga. 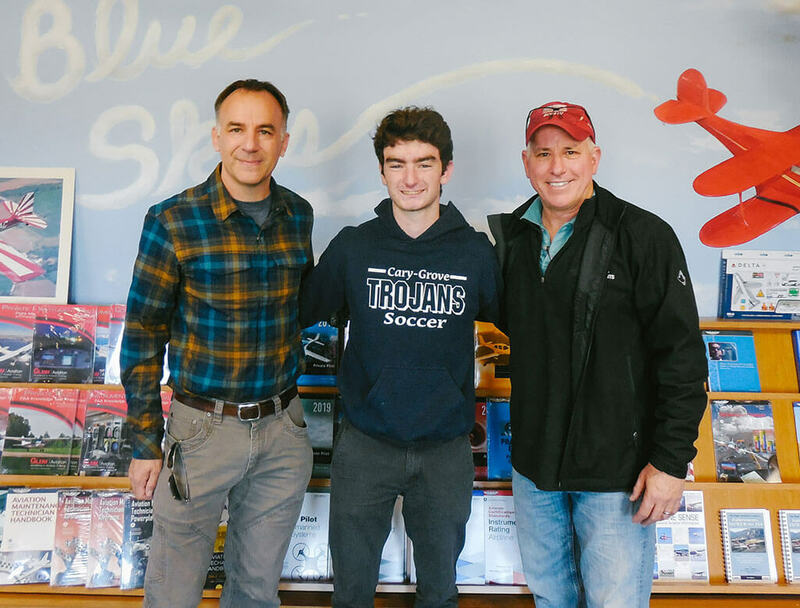 Pictured with his CFI Mike and DPE Dave Monroe! A huge congratulations to Quinton Urban, who completed his first solo in Piper Warrior N4627F! A big thanks to his CFII, Jim Fellers! A huge congratulations to Thomas Menner, who completed his first solo in Piper Warrior N32403! 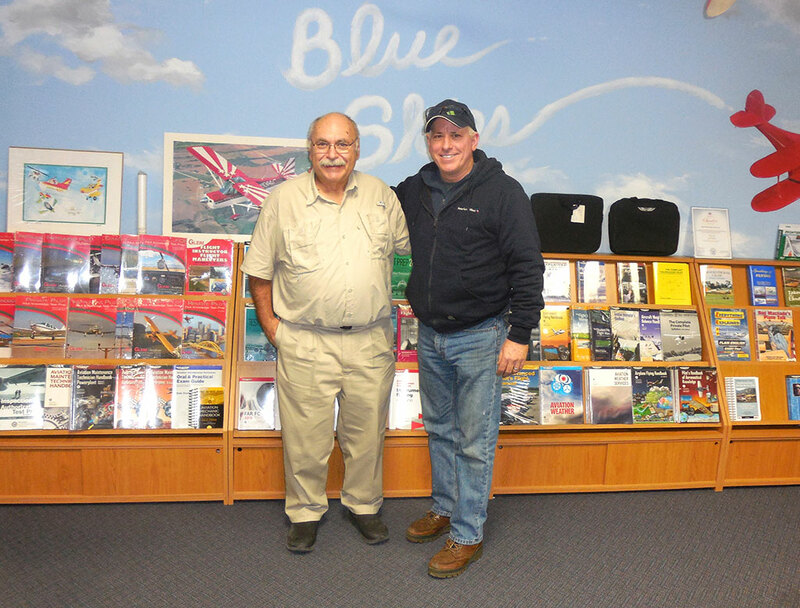 A big thanks to his CFI, Tom Laughlin! A huge congratulations to Riley Conroy, who completed his first solo in Piper Warrior N43020! 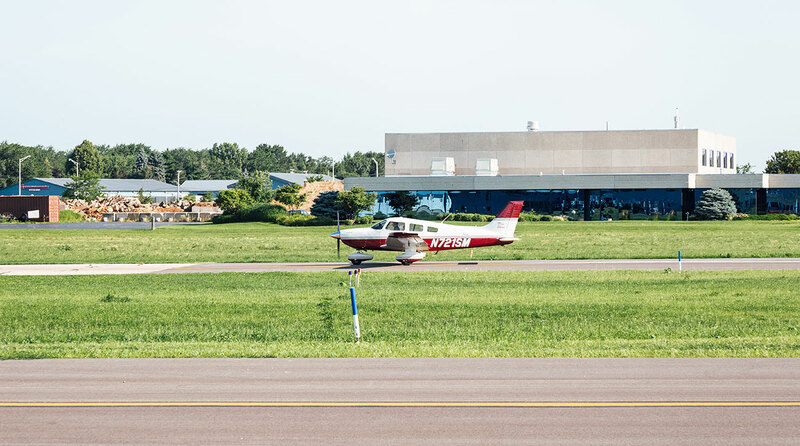 A big thanks to his CFI, Alex Priester! A huge congratulations to Manish Upadhyaya, who completed his first solo in Piper Warrior N43020! A big thanks to his CFII, Joe Zubay! 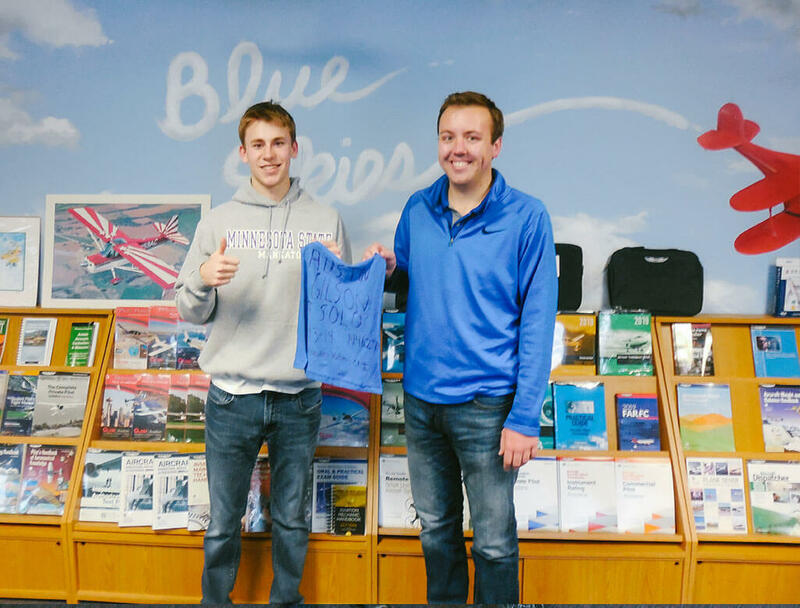 A huge congratulations to Bryan Huhn, who completed his first solo in Cessna N432ER! 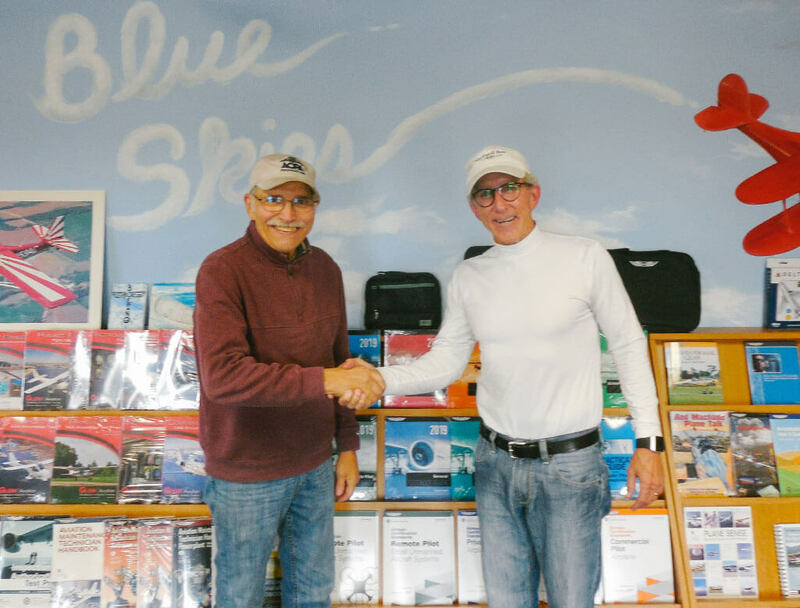 A big thanks to his CFI, Tom Laughlin! 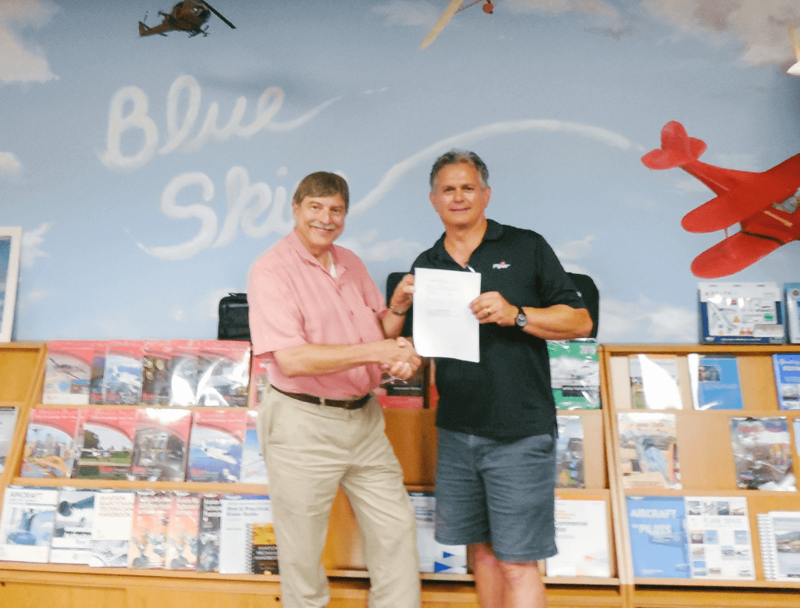 A huge congratulations to John McDowall, who passed his private pilot checkride in Cessna N432ER! 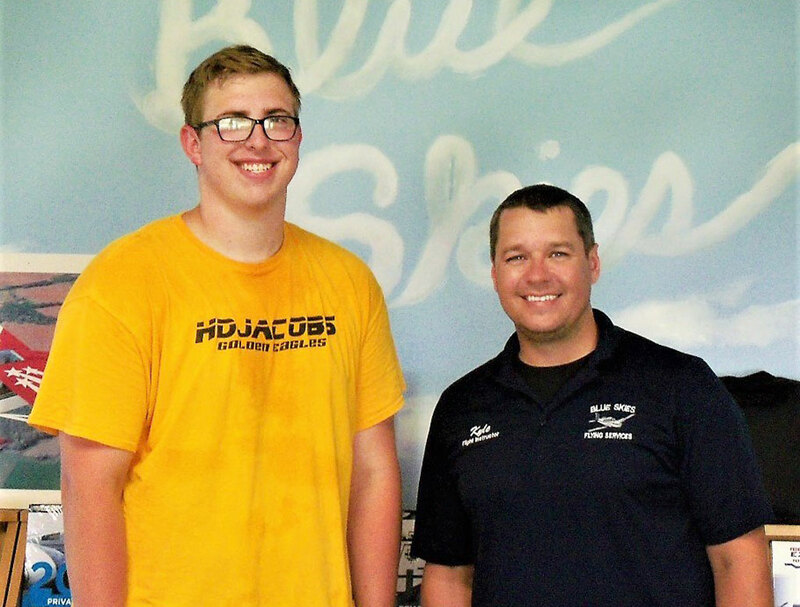 A big thanks to his CFI, Kyle Oligney! A huge congratulations to Matt Zimolzak, who completed his first solo in Piper Warrior N43020! 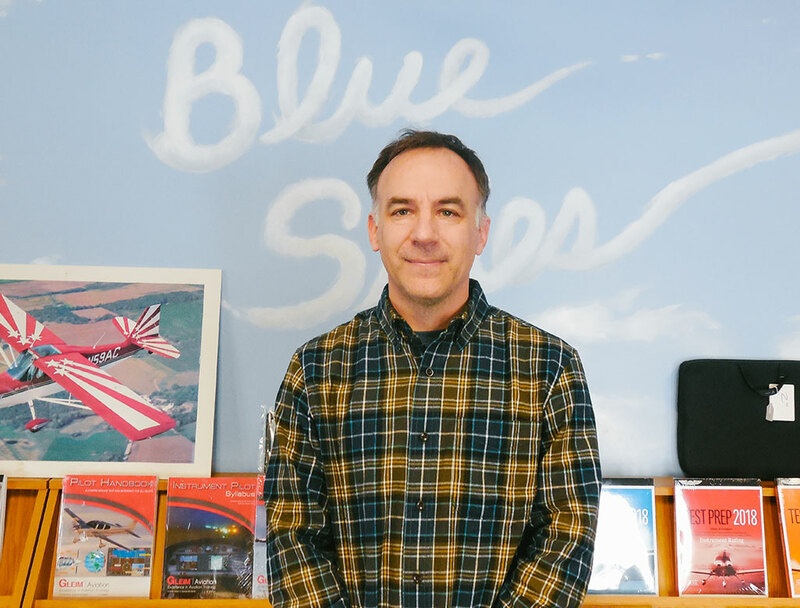 A big thanks to his CFI, Sean Fuhrer! 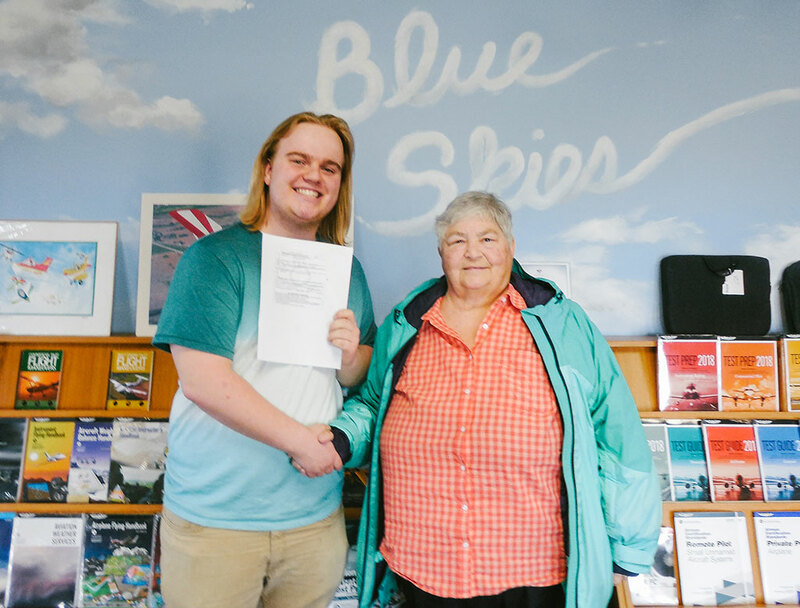 A huge congratulations to Brandon Kuhn, who passed his commercial checkride in Piper Arrow N33815! 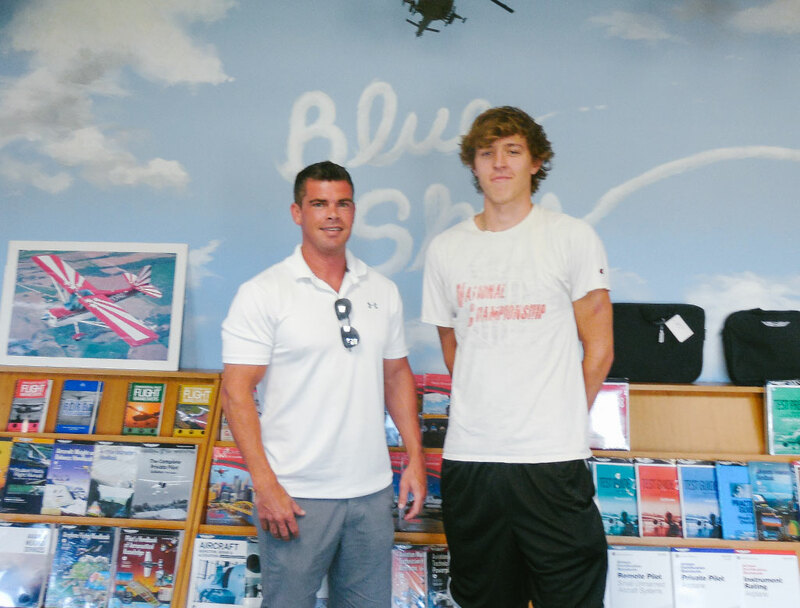 A big thanks to his CFI, Sean Fuhrer pictured with DPE Dave Monroe! A huge congratulations to Max Sexton, who passed his private pilot checkride in Piper Warrior N32403! 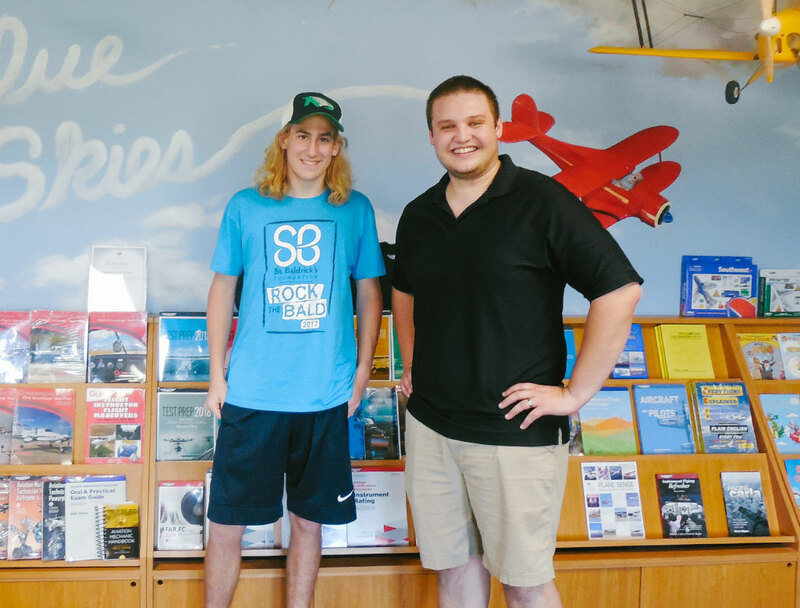 A big thanks to his CFI, Sean Fuhrer! A huge congratulations to Matt Zimolzak, who completed his first solo in Cessna N456ER! A big thanks to his CFII, Mike Biewenga! 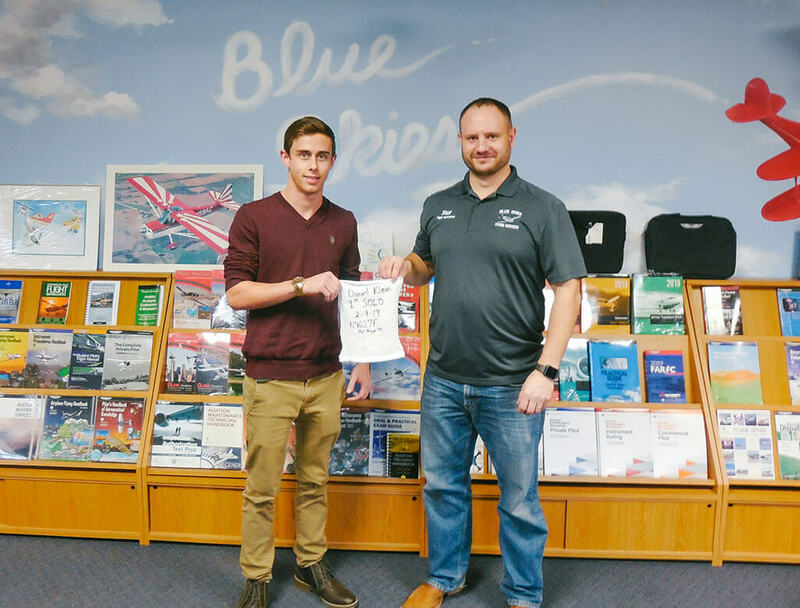 A huge congratulations to Alex Priester, who passed his CFI checkride! Here he is alongside DPE Skip Goss! A huge congratulations to Marcus Maschietto, who completed his first solo in Piper Warrior N4627F! A big thanks to his CFII Joe Zubay! A huge congratulations to Tyler Helsom, who completed his private pilot checkride in Piper Warrior N4627F! 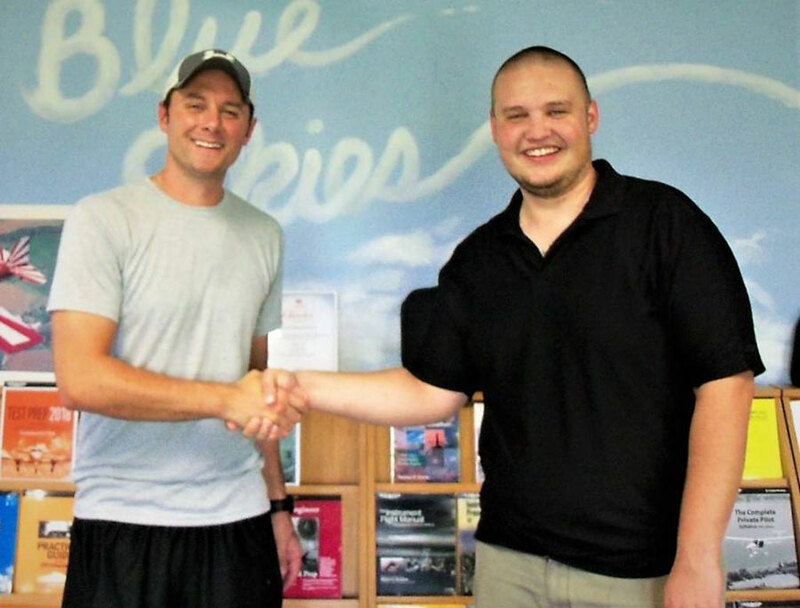 A big thanks to his CFI Sean Fuhrer pictured with DPE Dave Monroe! A huge congratulations to Gus Johnson, who completed his first solo in Piper Warrior N4627F! A big thanks to his CFI Sean Fuhrer! A huge congratulations to Chris Cunningham, who completed his private pilot checkride in Piper Warrior N4627F! 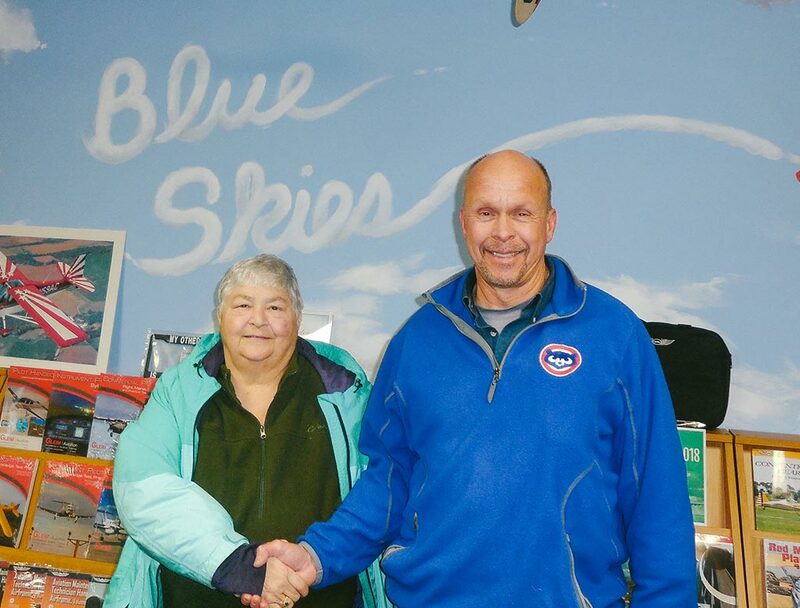 A big thanks to his CFI Jim Fellers, as well as DPE Gail Lapook! 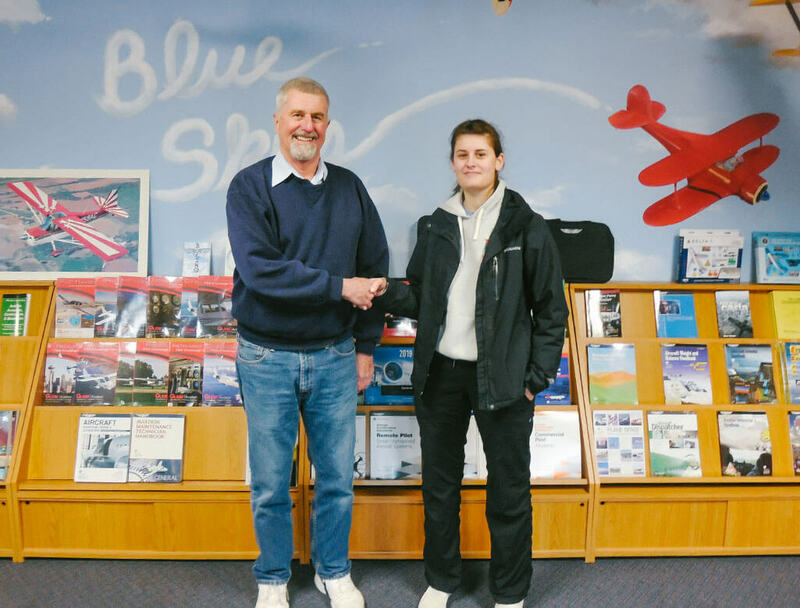 A huge congratulations to Cullen Chudik, who completed his first solo! 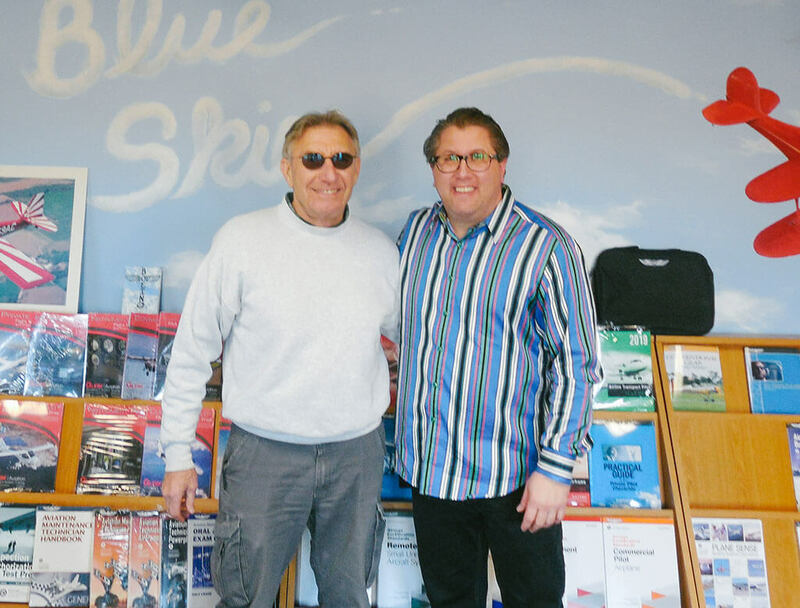 A big thanks to his CFI, Tom Laughlin! A huge congratulations to Jarrett Natrop, who completed his private pilot checkride in Piper Warrior N32403! A big thanks to his CFII Mike Biewenga, as well as DPE Gail Lapook! A huge congratulations to Jerry Thomas, who completed his SECOND solo in Cessna N456ER! A big thanks to his CFII, Jim Fellers! 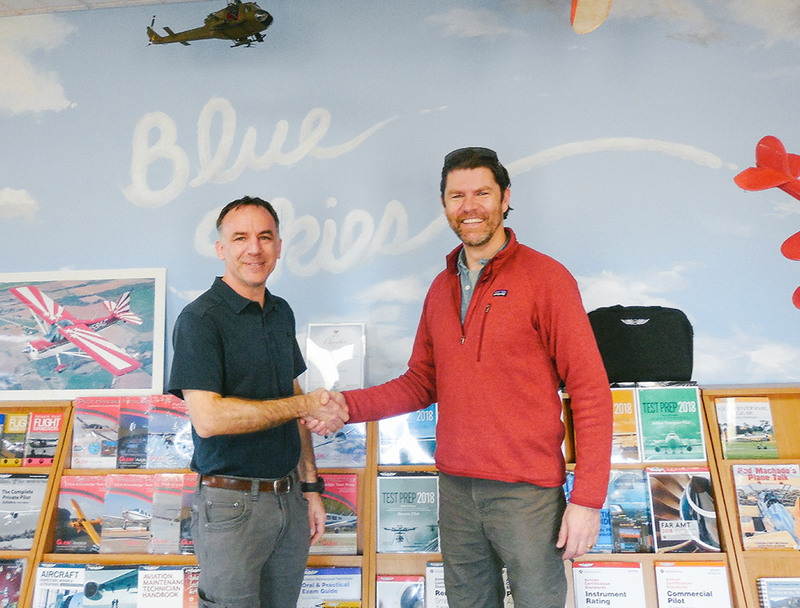 A huge congratulations to Nathan Hartley, who passed his CFI checkride in N33815! A big thanks to his CFII, Mike Biewenga and DPE Ron Ridenour! 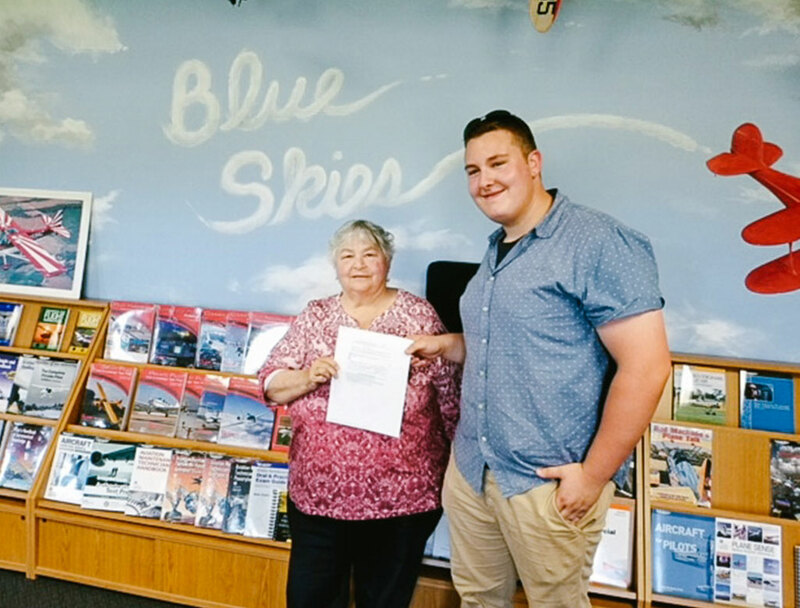 A huge congratulations to Kollin Stagnito, who passed his commercial checkride in N33815! 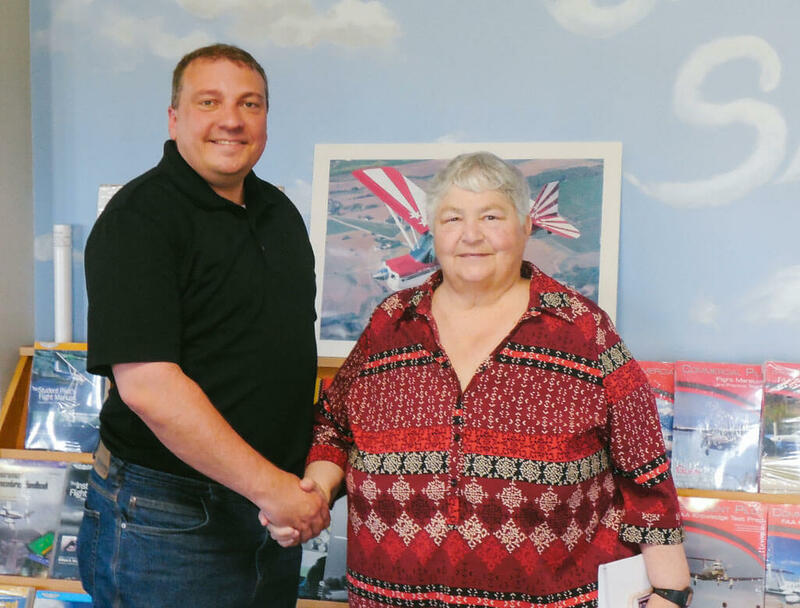 A big thanks to his CFI, Kyle Oligney as well as DPE Gail Lapook! 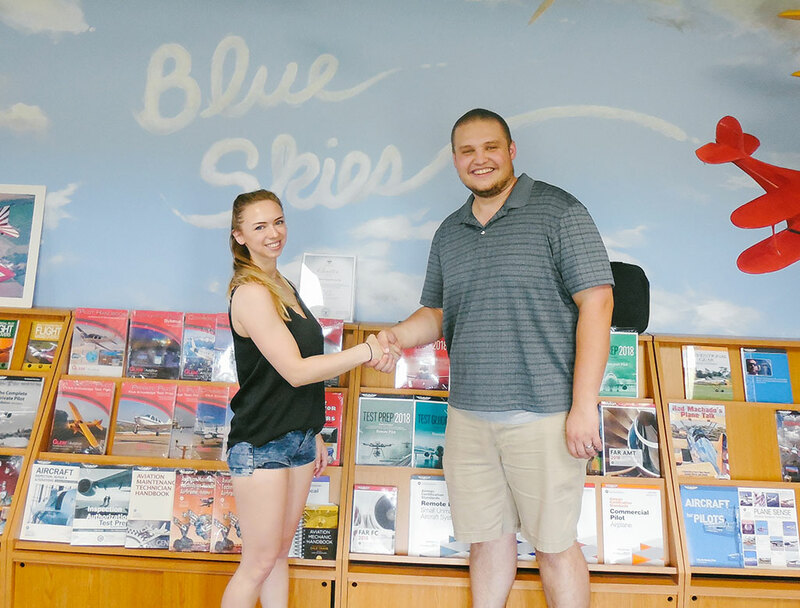 A huge congratulations to Kelsey Flannery, who completed her private pilot checkride in N43020! 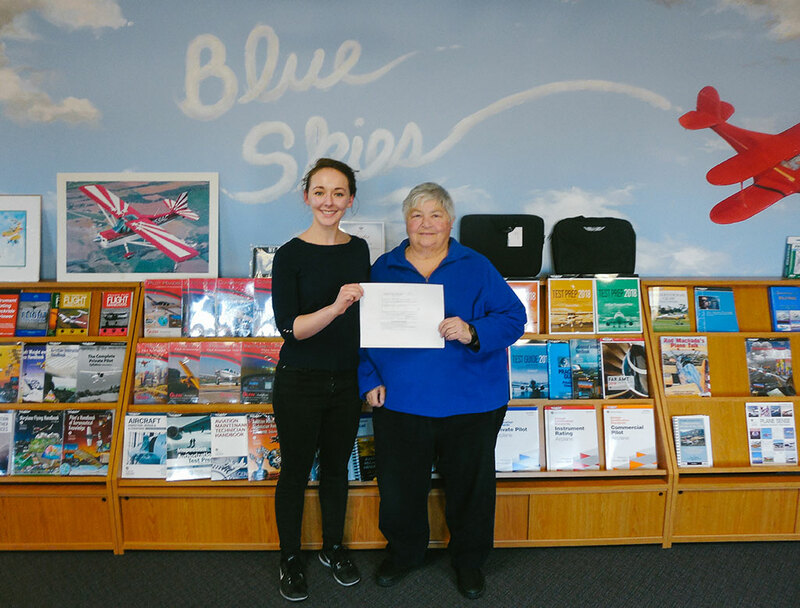 A big thanks to her CFI, Kyle Oligney as well as DPE Gail Lapook! A huge congratulations to Dominic Green, who completed his first solo in N32403! A big thanks to his CFII, Mike Biewenga! 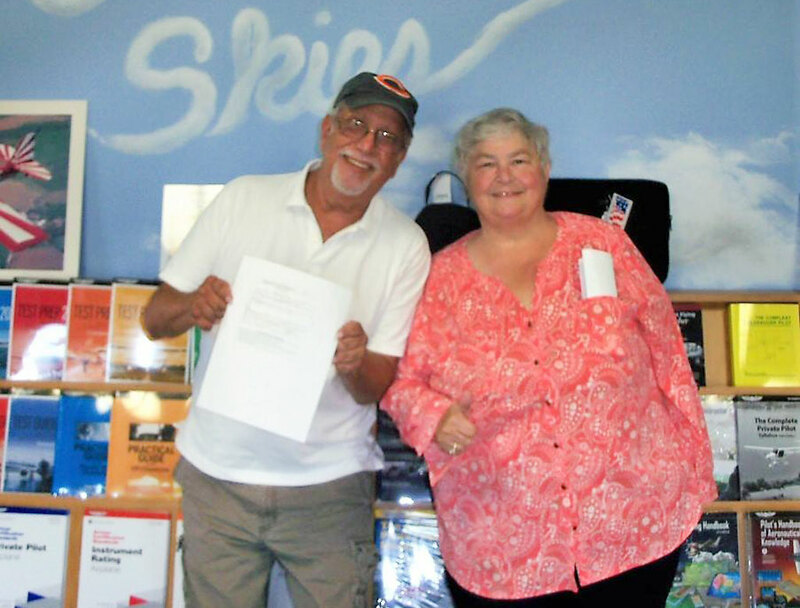 A huge congratulations to Marty Stanton, who passed his instrument rating! Also a big thanks to his CFII, Mike Biewenga and DPE Gail LaPook! 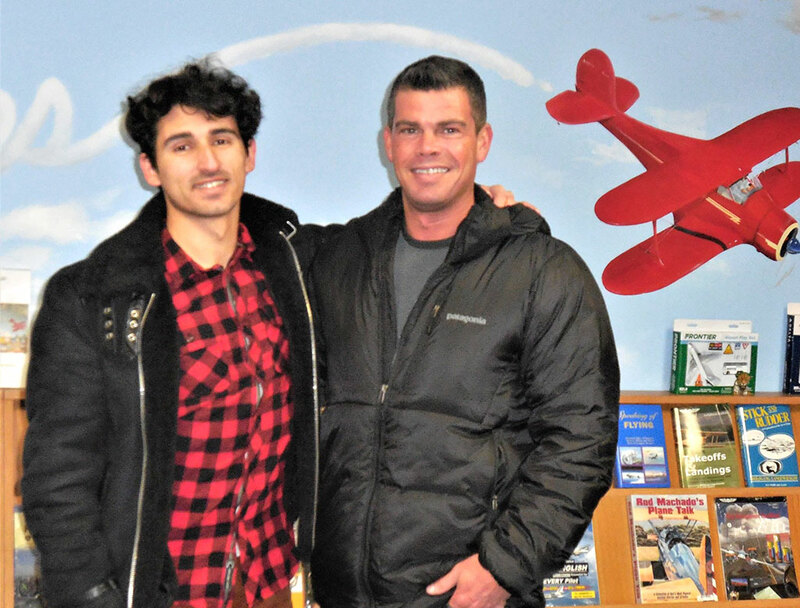 A huge congratulations to Hamlet Fasliu, who passed his private pilot checkride in N456ER! Also a big thanks to his CFI, Tom Laughlin! 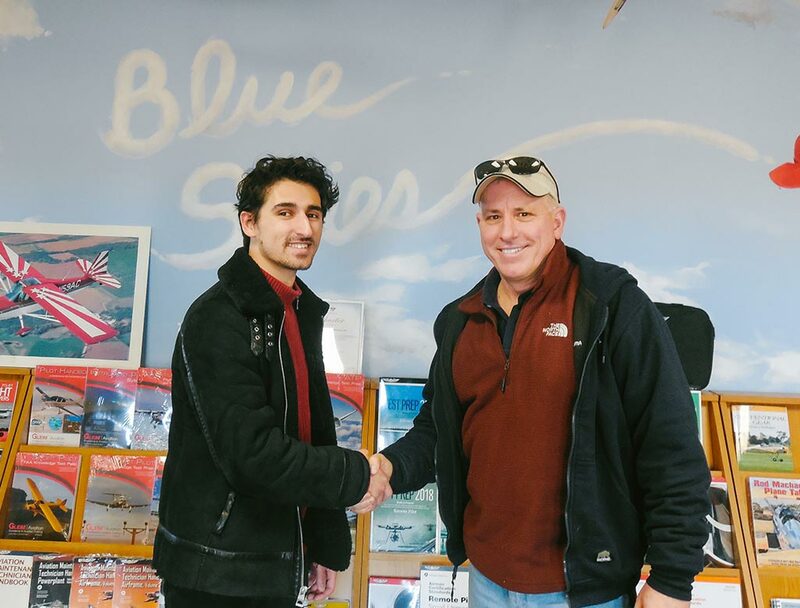 A huge congratulations to Alex Priester, who passed his commercial checkride in Piper Arrow N33815! 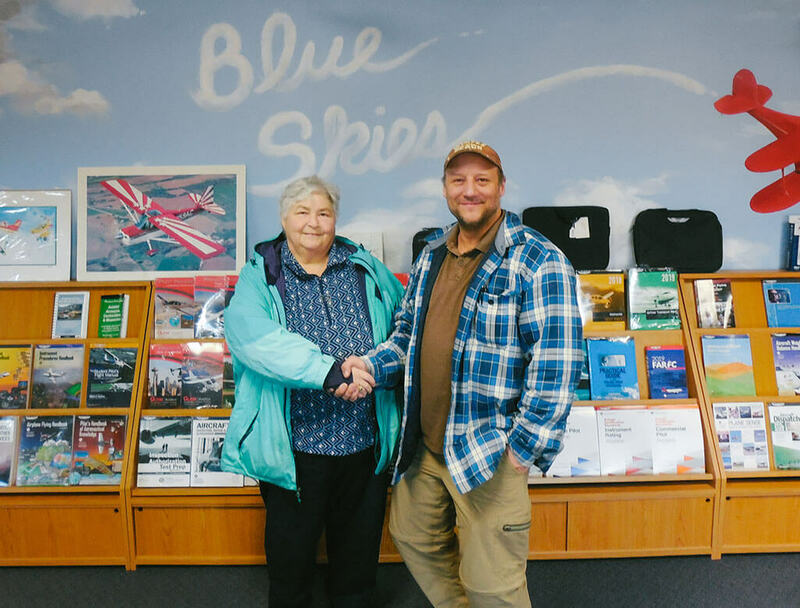 Also a big thanks to his CFI, Kyle Oligney and DPE Gail Lapook! 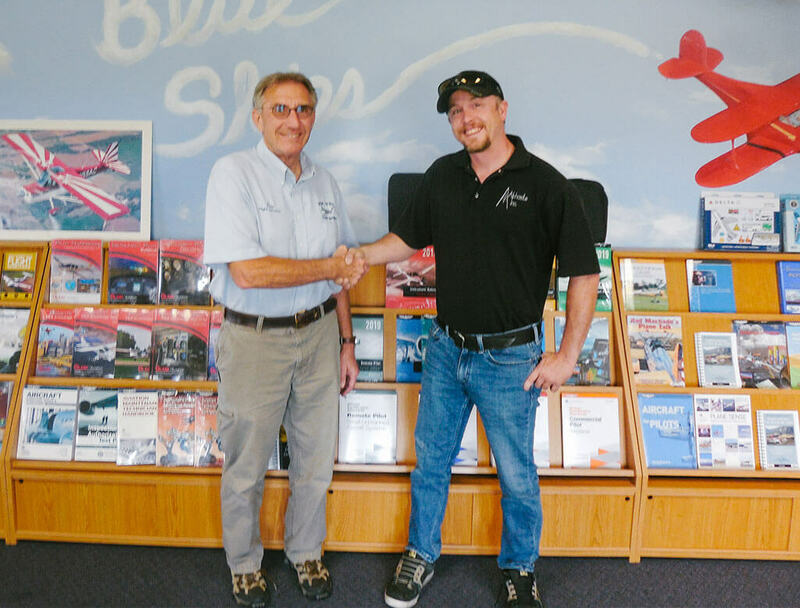 A huge congratulations to Jeff Lilly, who passed his private pilot checkride in N456ER! 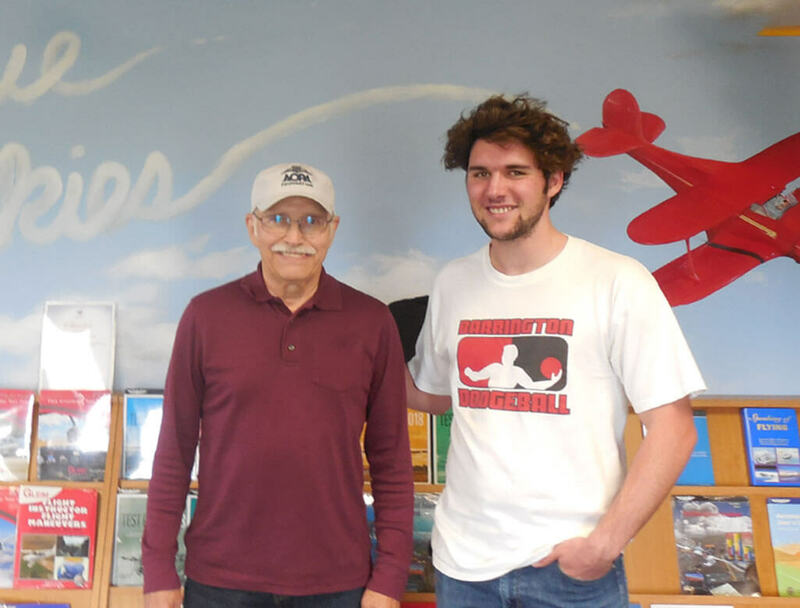 Also a big thanks to his CFII/ Chief Flight Instructor, Jim Fellers! 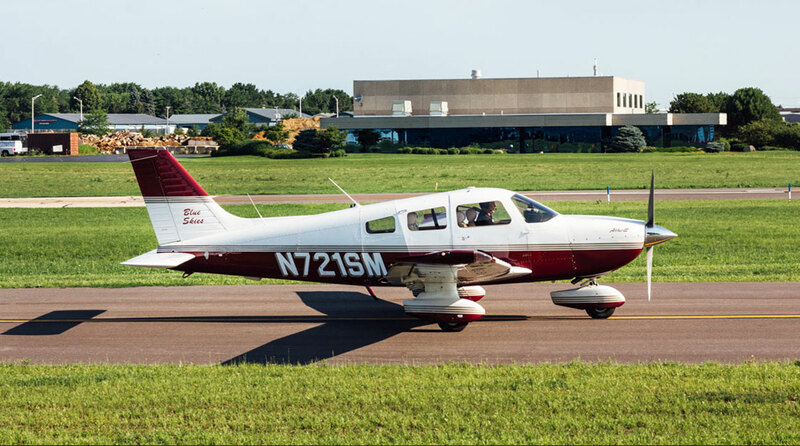 A huge congratulations to James Smieszkal, who completed his private pilot checkride in Piper Warrior N43020! 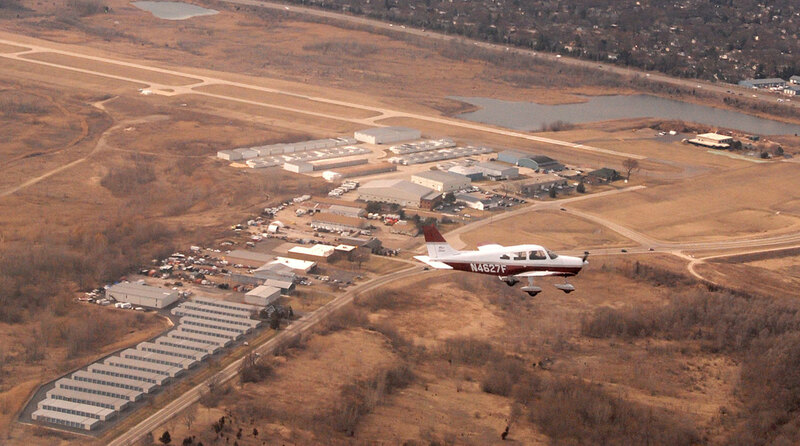 Also a big thanks to his CFII/Chief Flight Instructor Jim Fellers as well as DPE Gail Lapook! A huge congratulations to Patrick Helms, who completed his first solo in Piper Warrior N43020! Patrick also holds a rotorcraft rating as well. Also a big thanks to his CFI Kyle Oligney! 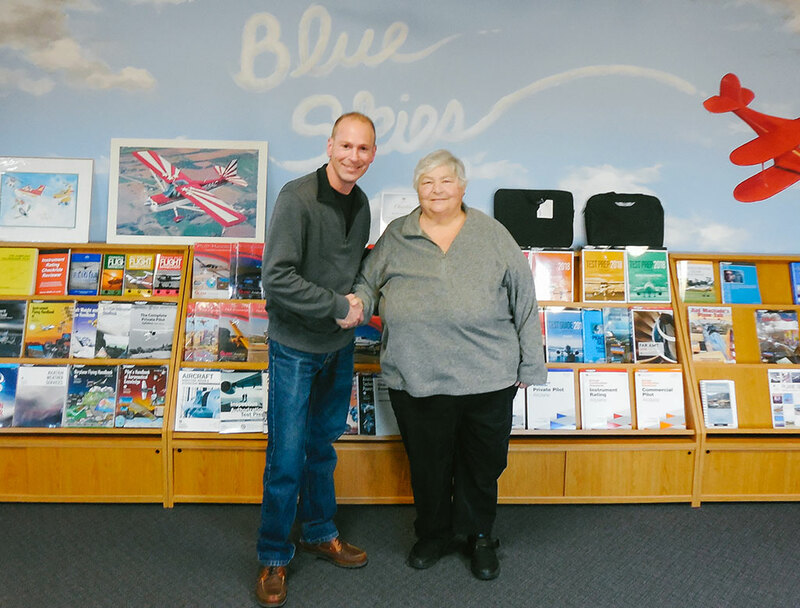 A huge congratulations to Tom Blackman, who completed his instrument checkride in Piper Warrior N4627F! Also a big thanks to his CFII Mike Biewenga as well as DPE Gail Lapook! 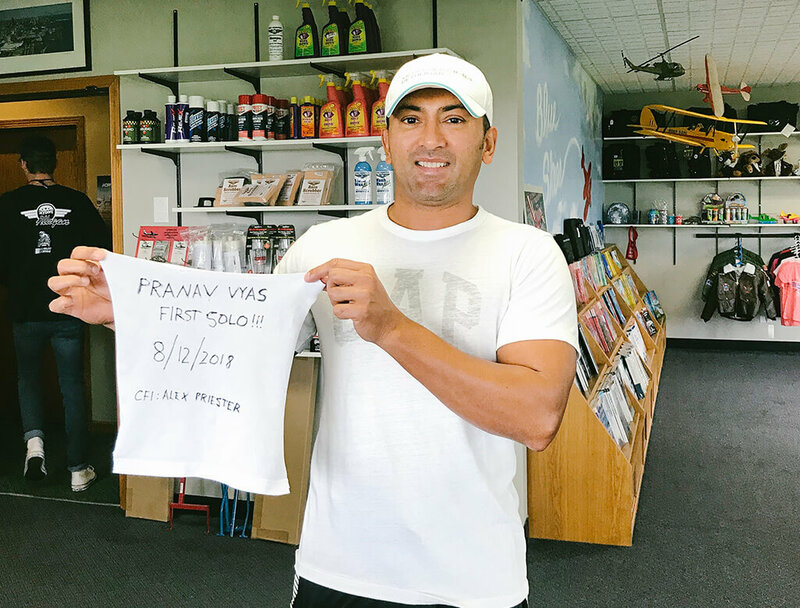 A huge congratulations to Hamlet Fasliu, who took his first solo in Cessna N456ER! Also a big thanks to his CFI Tom Laughlin! A huge congratulations to Pat Creegan, who took his first solo in Piper Warrior N43020! Also a big thanks to his CFII Mike Biewenga! 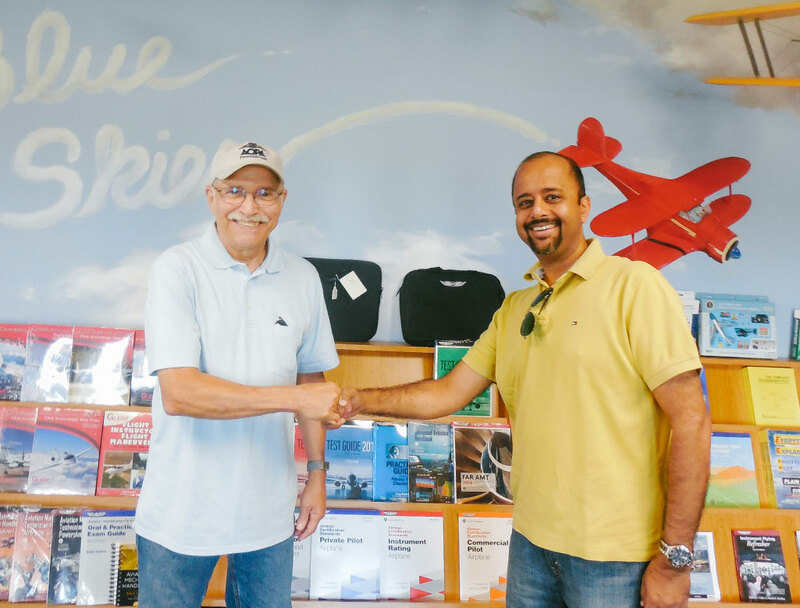 A huge congratulations to Aaditya Rawal, who passed his Private Pilot checkride in Piper Warrior N43020! Also a big thanks to his CFI Kyle Oligney and DPE Gail Lapook! 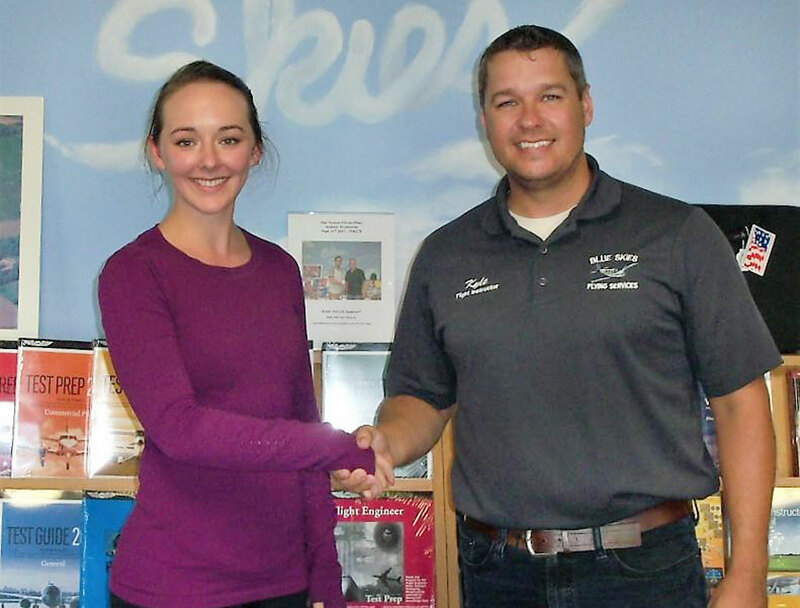 Congratulations to Kelsey Flannery, who completed her first solo in Piper Warrior N43020! Also a big thanks to her CFI Kyle Oligney! 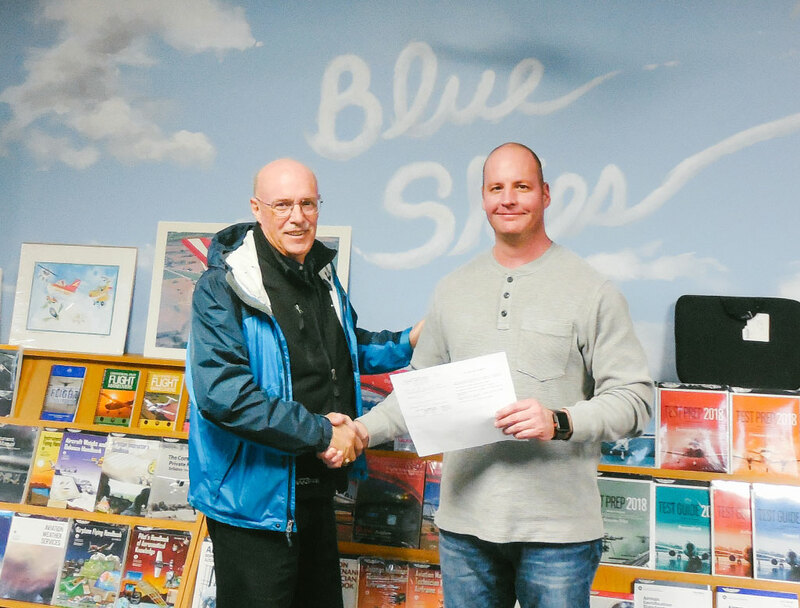 Congratulations to Mike Mantel, who passed his Private Pilot check ride in Cessna N432ER! 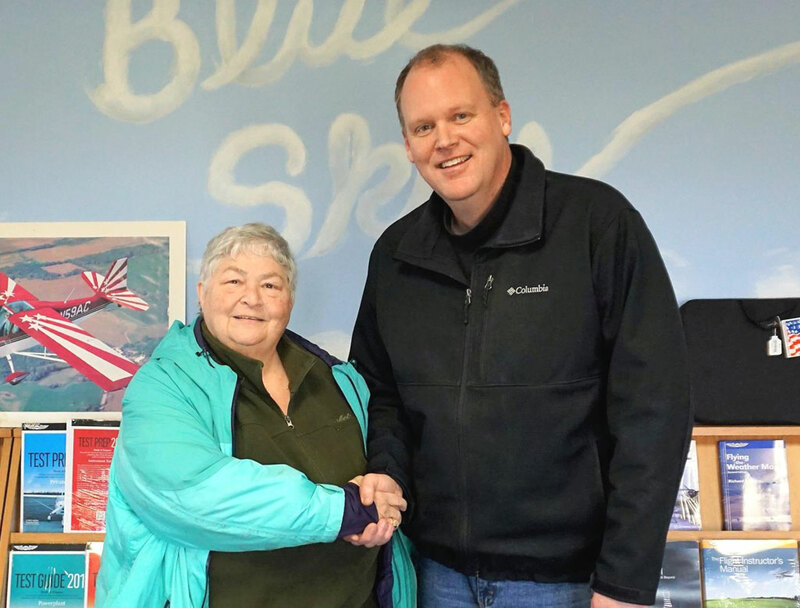 Also a big thanks to his CFI/CFII/Chief Flight Instructor, Jim Fellers and to DPE Gail Lapook! 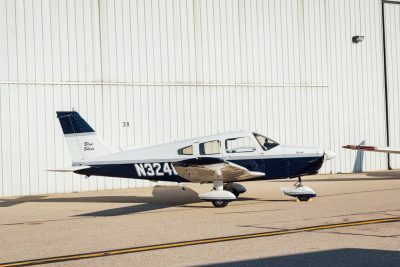 Congratulations to Chris Wilson on his first solo in Piper Warrior N4627F! Also a big thanks to his CFII, Joseph Zubay! Congratulations to Andrew Wisniewski, who passed Private Pilot check ride in Piper Warrior N4627F! Also a big thanks to his CFI, Alex Amann as well as DPE, Dave Monroe! Congratulations to Max Sexton who completed his first solo in Piper Warrior N32403! Also a big thanks to his CFI, Sean Fuhrer! 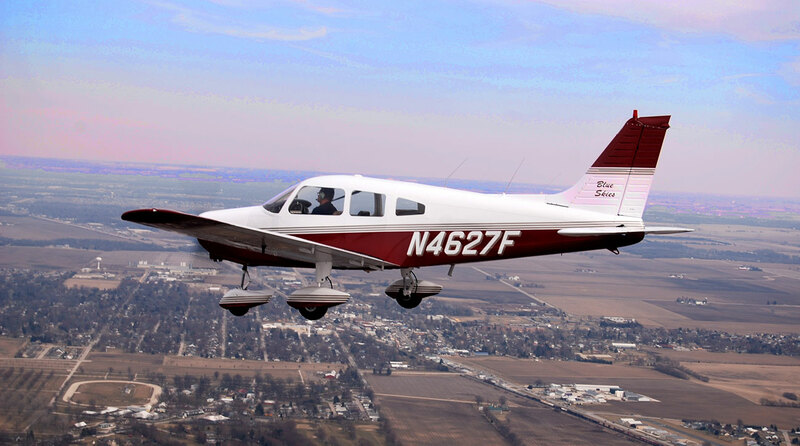 Congratulations to Greg Kuhlman who passed his Private Pilot check ride in Piper Warrior N4627F! 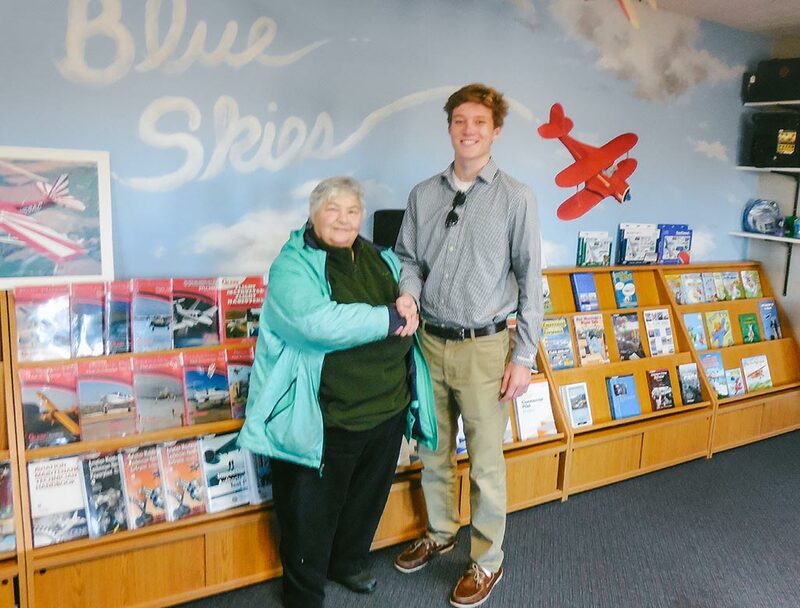 Also a big thanks to his CFI, Chase Matheson and DPE, Gail Lapook! Congratulations to Lucas Chaffin who completed his first solo in Piper Warrior N32403! Also a big thanks to his CFI, Kyle Oligney! 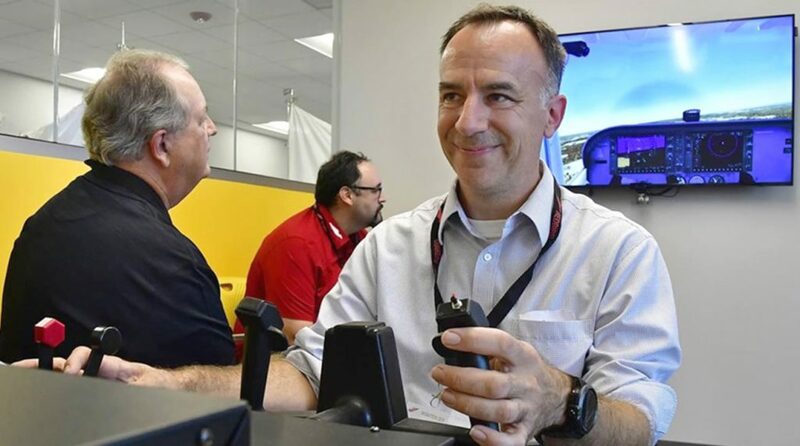 The FAA recognized our very own CFI Mike Biewenga as a Gold Seal Flight Instructor! 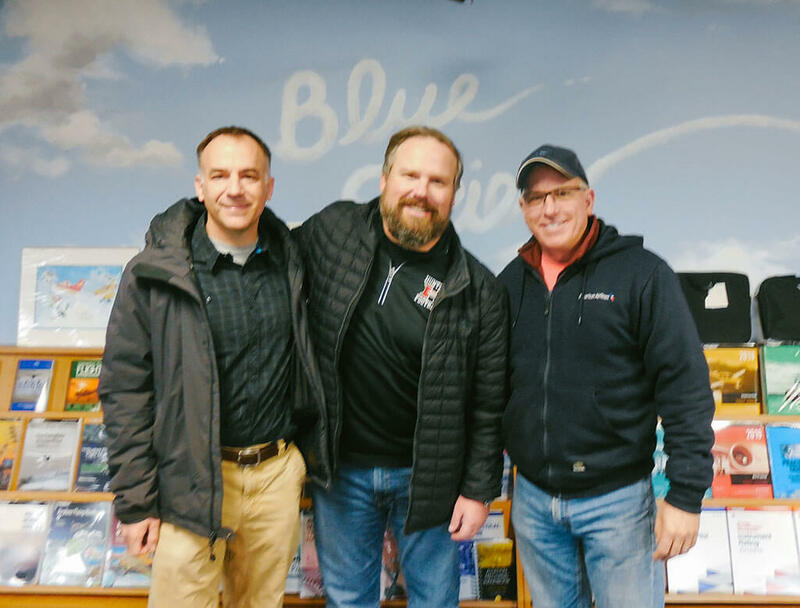 Blue Skies Flying Services’ instructors are some of the greatest instructors in the industry. 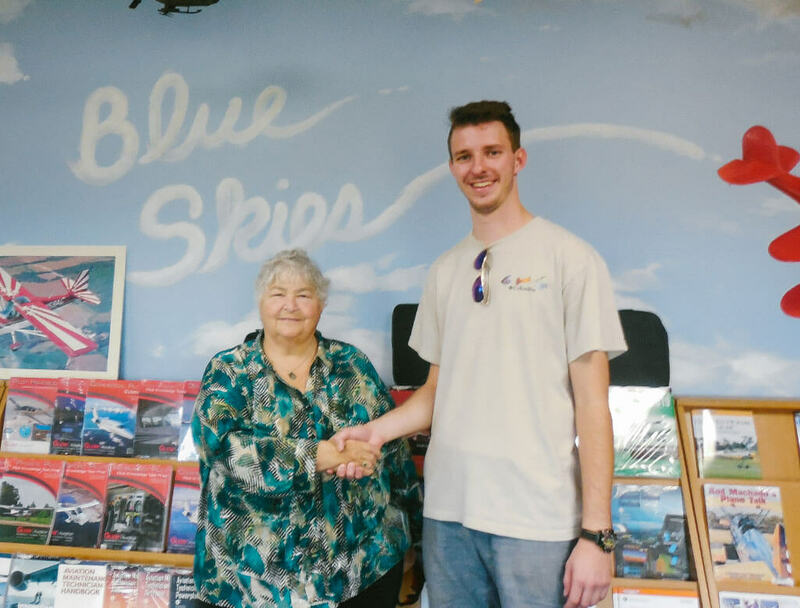 We pride ourselves on making our students feel like part of the Blue Skies family while flight training and continue with us afterwards. 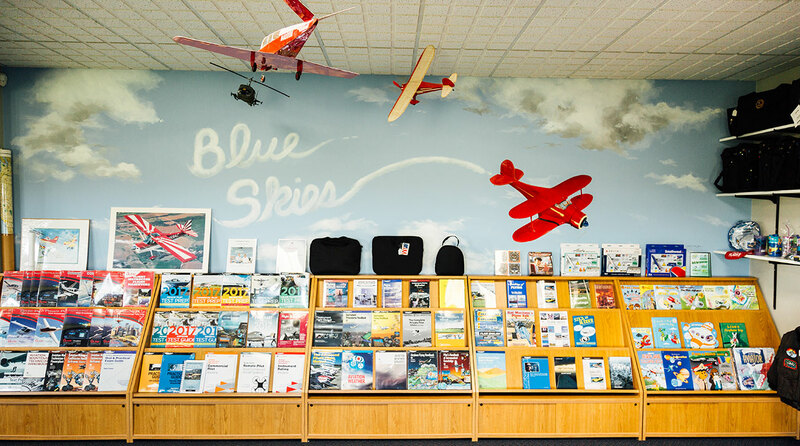 While training at Blue Skies Flying Services you will have access to some of the industry’s leading aircrafts. 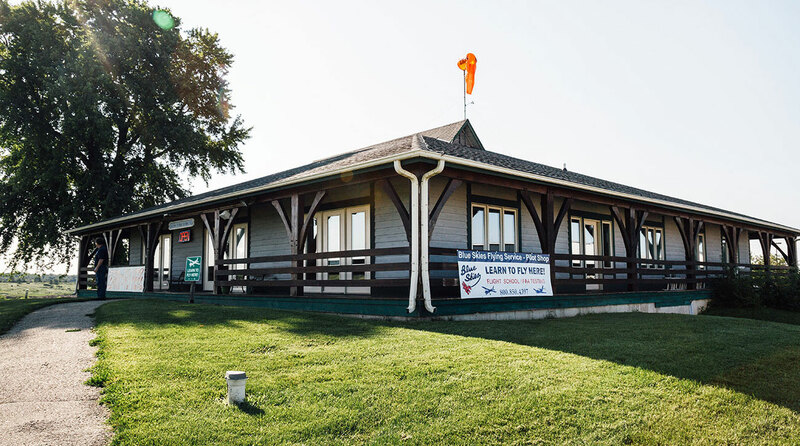 Blue Skies also has a FAA approved simulator that can be used during Instrument training. 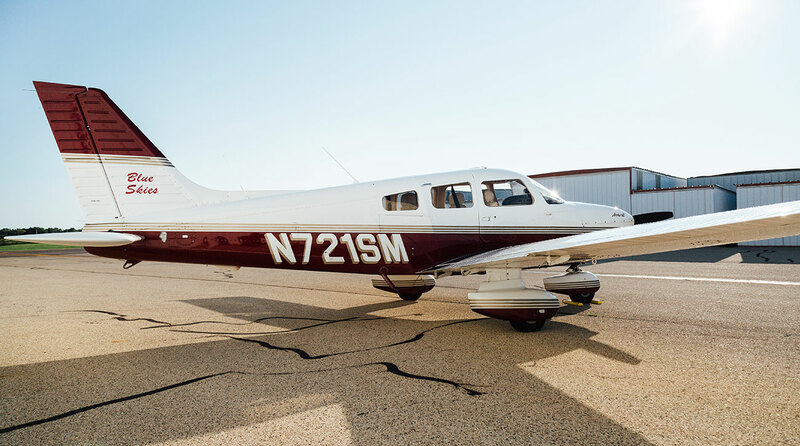 Our superbly maintained fleet of aircraft range in complexity from single-engine 2-seat trainers to 6-seat, all-weather, aircrafts. 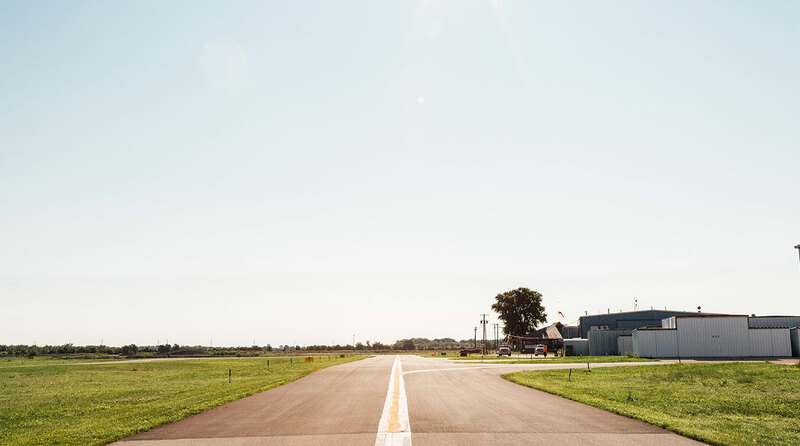 Our aircraft are equipped with state-of-the-art avionic—most planes have GPS, autopilot, are 4/6-place intercoms, and are less than 10 years old. 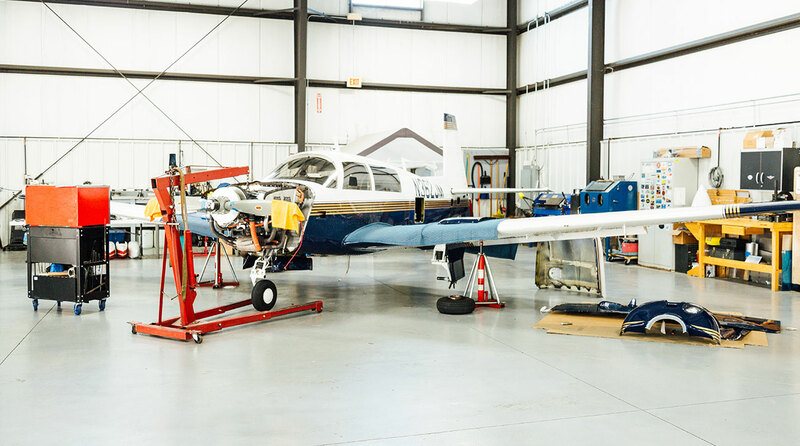 For over 20 years, Blue Skies Flying Services has been in the aircraft maintenance business, servicing single engine, multi-engine, turbo prop, and even turbine aircraft. Need and Annual Inspection, GPS updates, aircraft detail, or just some air in the tires, stop in and see the guys in the maintenance shop. 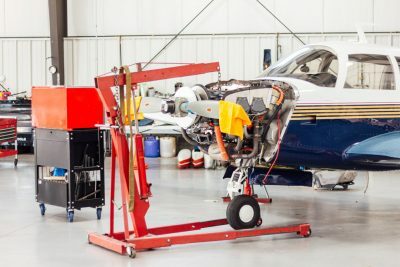 Let Blue Skies handle your aircraft maintenance needs.